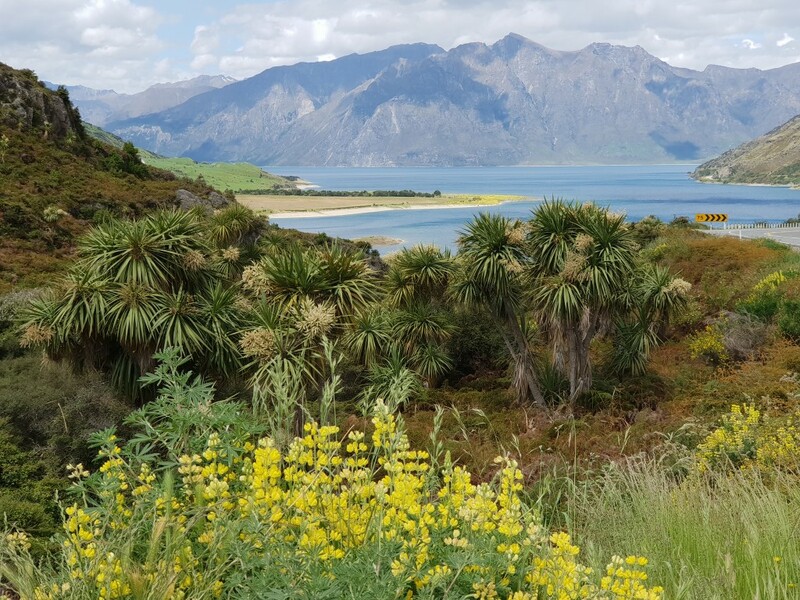 With the best intentions to write my final blog on my NZ travels before the end of 2018 I failed! With only a few days between arriving home and our boys coming home to join us for a week over Christmas it didn’t happen unfortunately. But here it is! 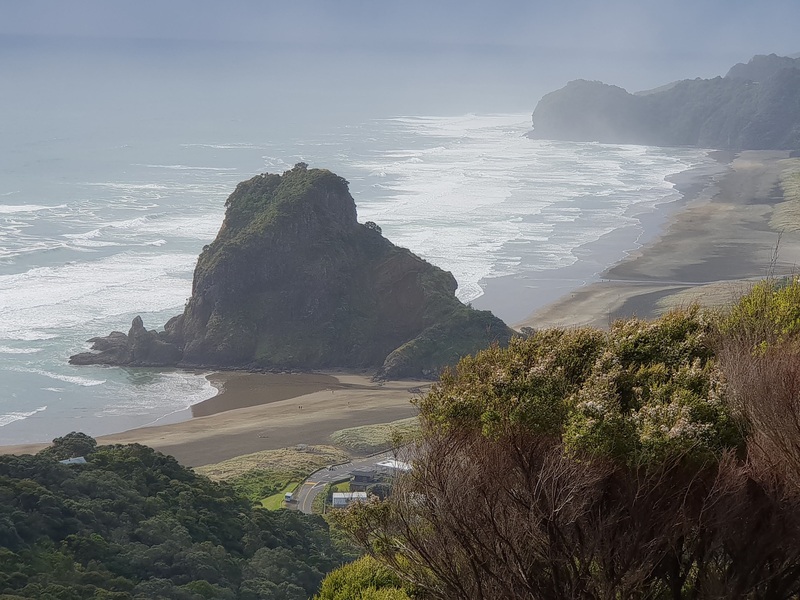 After travelling down the west coast we moved inland and stayed in Te Anu so we could drive to Milford Sound. 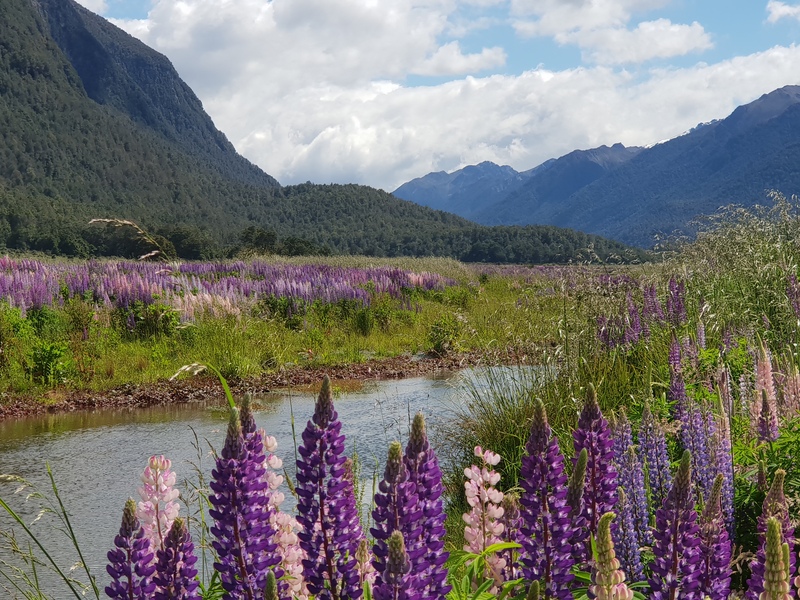 We enjoyed more amazing scenery with a trip into Fiordland, driving along the river valley with wild lupins growing in abundance. Towards Milford Sound the valley gets deeper and the mountains get higher. 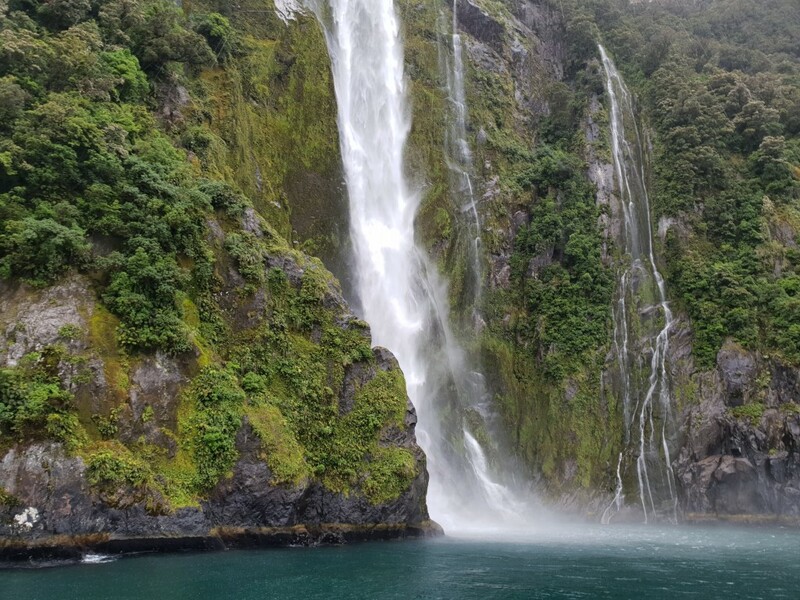 The boat trip when we arrived was fabulous, we saw seals and waterfalls everywhere along the sheer sides of the fiord. 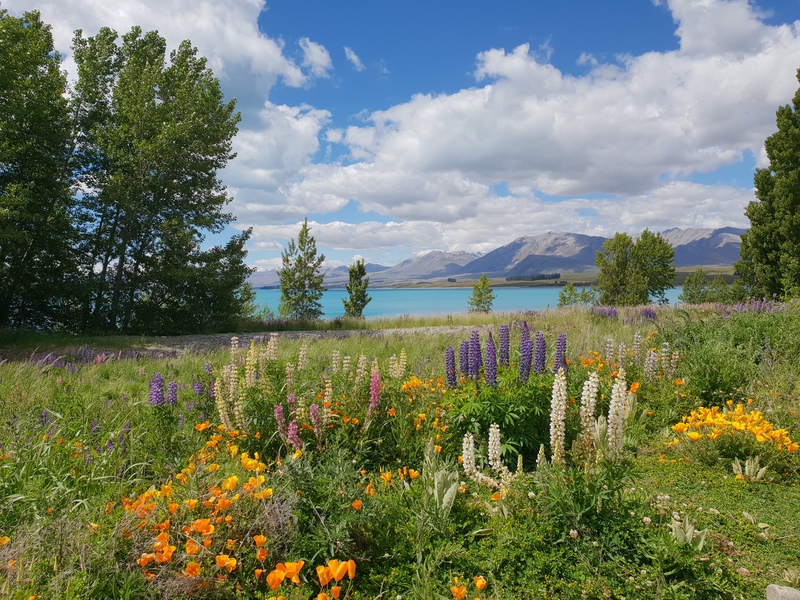 A few days in Lake Tepeko was the next stop, turquoise water looked almost unnatural and the surrounding snow capped mountains made a beautiful backdrop. We went up to the observatory to see the 360° view, breathtaking! Final destination before heading home was Christchurch. We have had not been prior to the earthquake so couldn’t compare then and now but there was plenty of evidence of a city being rebuilt. The Christchurch Gallery is an amazing building. 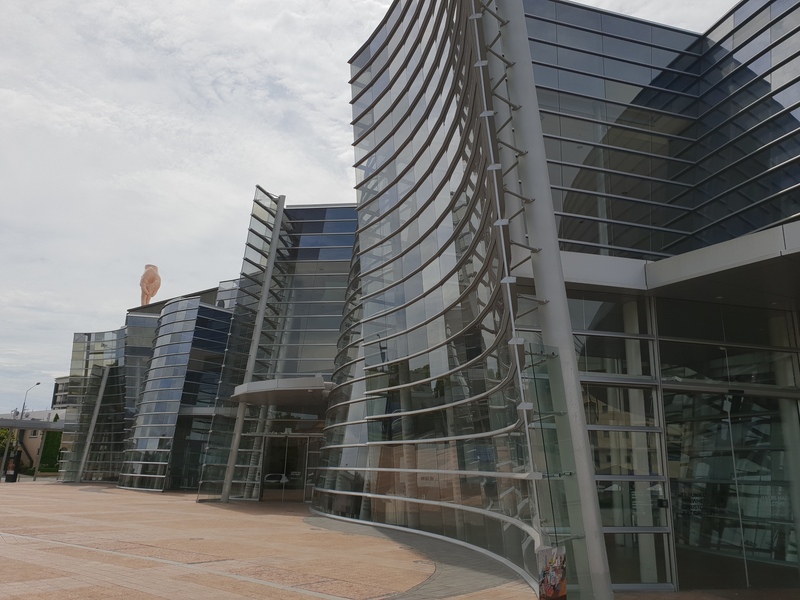 The exterior has beautiful curved glass walls and inside is light and spacious with national and international artists well represented . 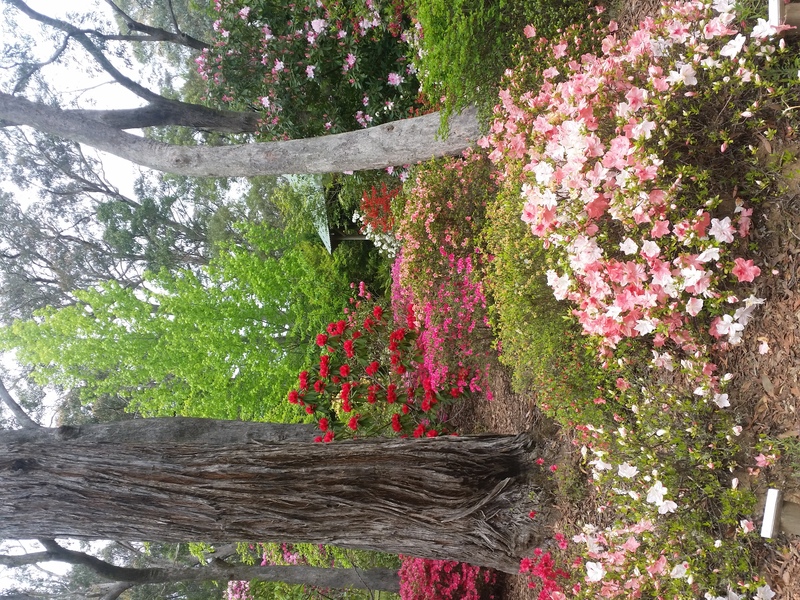 We enjoyed the Botanical Gardens too. 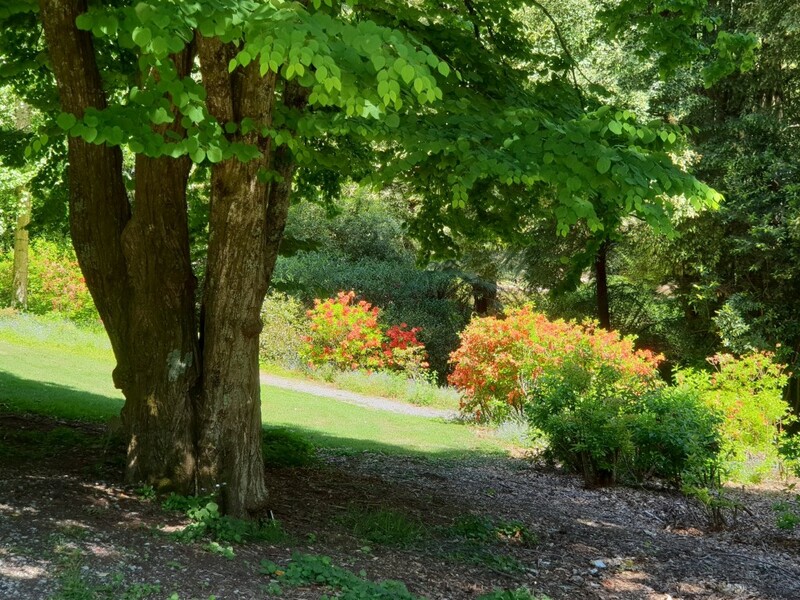 Its huge with a river meandering through it and a lot of variety of native trees and flowers. 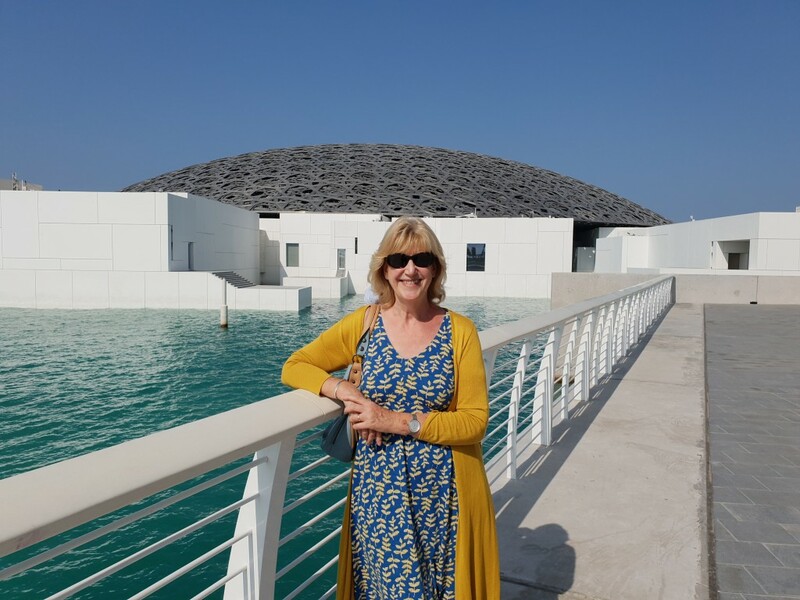 Home was via Abu Dhabi with an opportunity to see the Louvre Gallery. 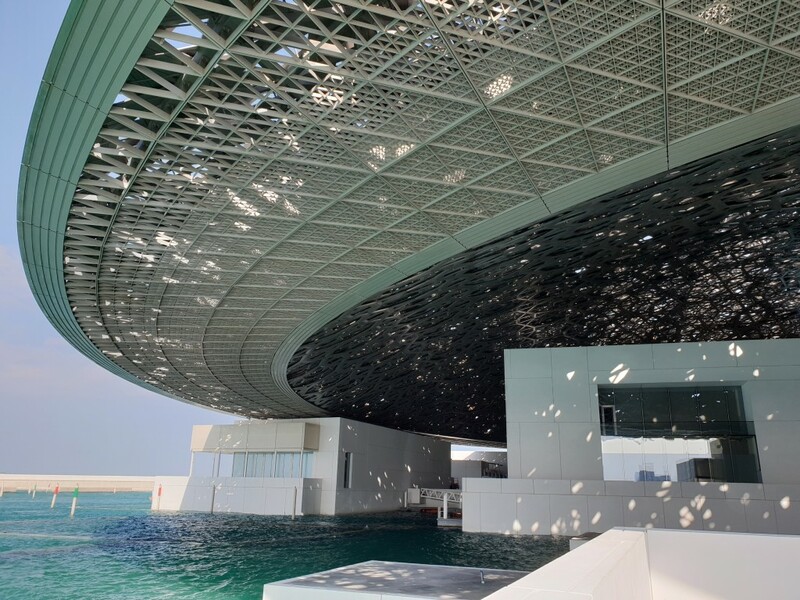 A truly amazing building with a metal lace dome curving over a cluster of white buildings all on the waters edge. 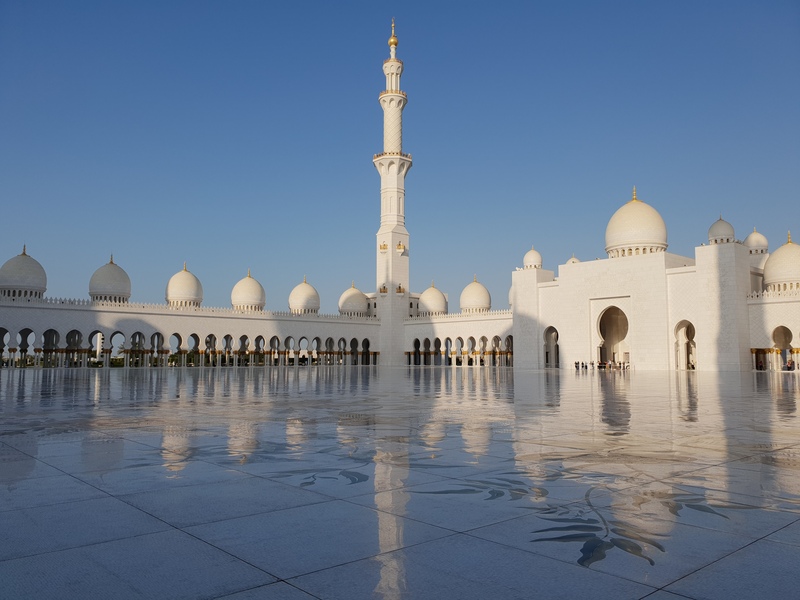 We couldn’t leave before visiting the Grande Mosque, the largest in the world and awe inspiring in its scale and majesty . This was an inspirational trip. I took hundreds of photographs and I am full of ideas for new embroideries. Watch this space! 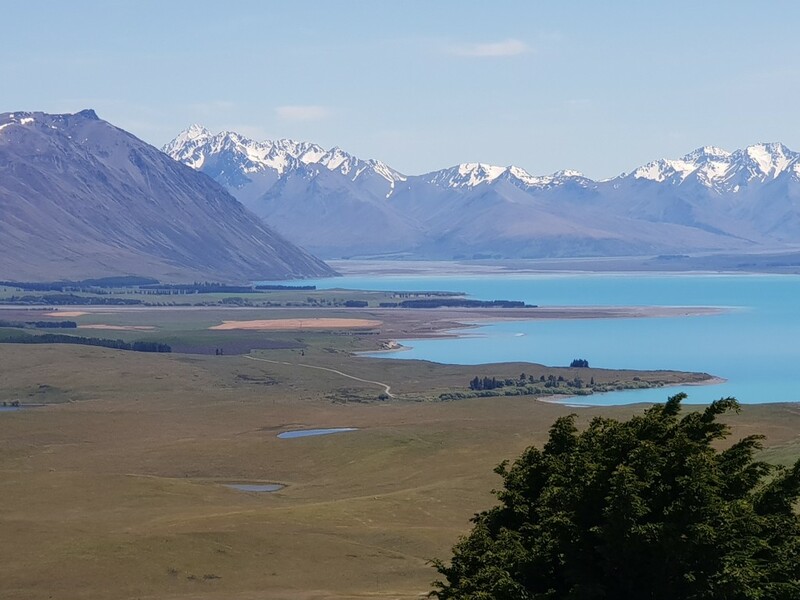 This trip continued to be a combination of inspiration for my work and a success in Napier! Apologies for all the photos it’s been a challenge to choose from so many. I hope it gives a flavour of the amazing country of NZ. 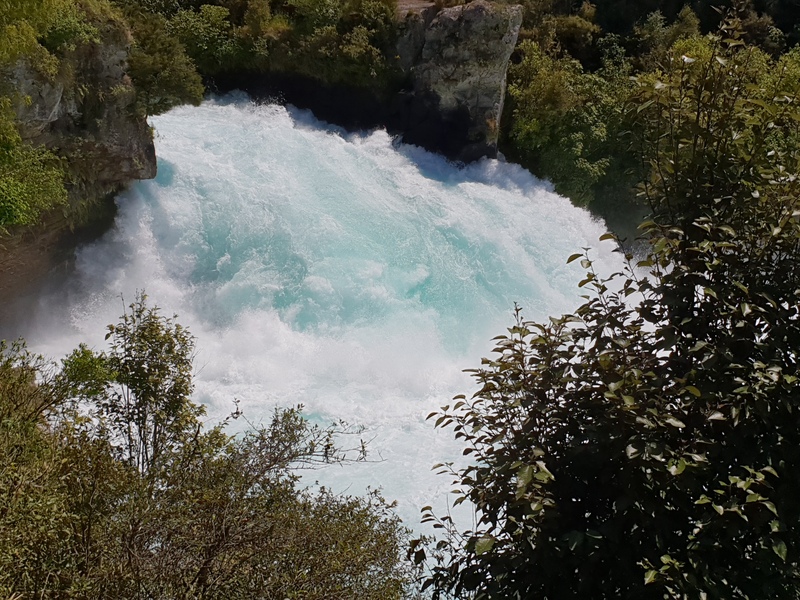 We travelled across country from Auckland towards the east coast, stopping at the Huka Falls nr Taupo en route. What an amazing sight, the colour of the water was a deep turquoise and the volume incredible to see. Moving on we arrived in Hastings and Napier for a 6 day stay. 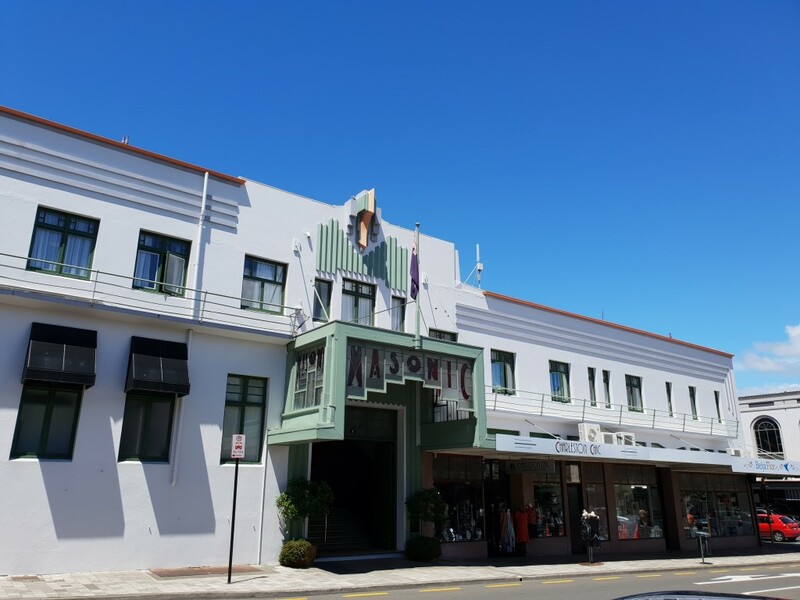 Napier is a beautiful Art Deco coastal town, with great architecture, galleries, coffee shops and long elegant seafront promenade and gardens. Whilst there I visited the Boyd Dunlop Gallery in the town which has a strong eclectic mix of art on show. They represent some well respected NZ and international artists and I now have my work there too! 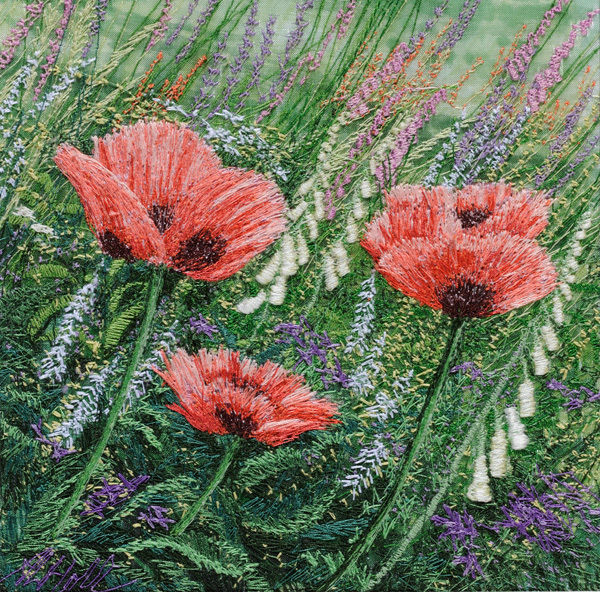 They have 9 of my embroideries and will display several of them in their Christmas Show. I am thrilled to have my work there and we have plans for a show in 2019. 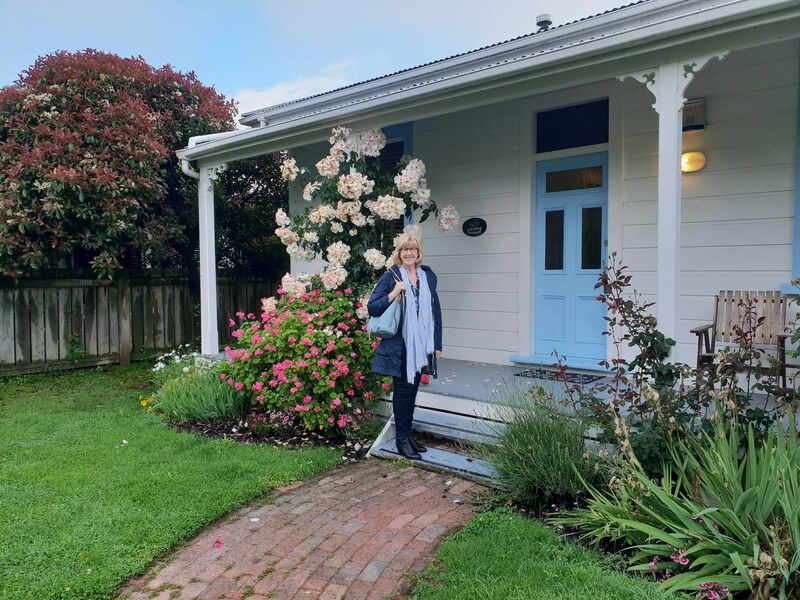 We headed on from the east coast to wine country and to Martinborough for 1 night to enjoy the region for the second time. 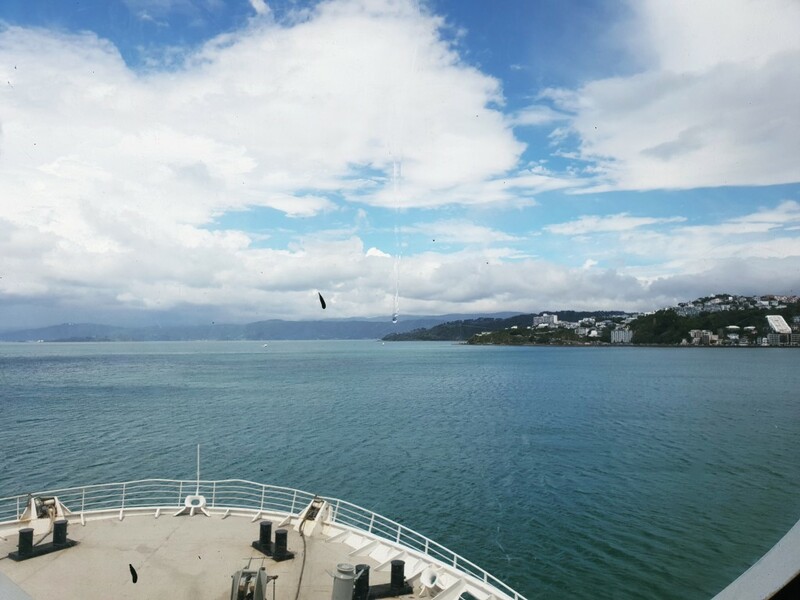 We then went down to Wellington to catch the ferry over to South Island. 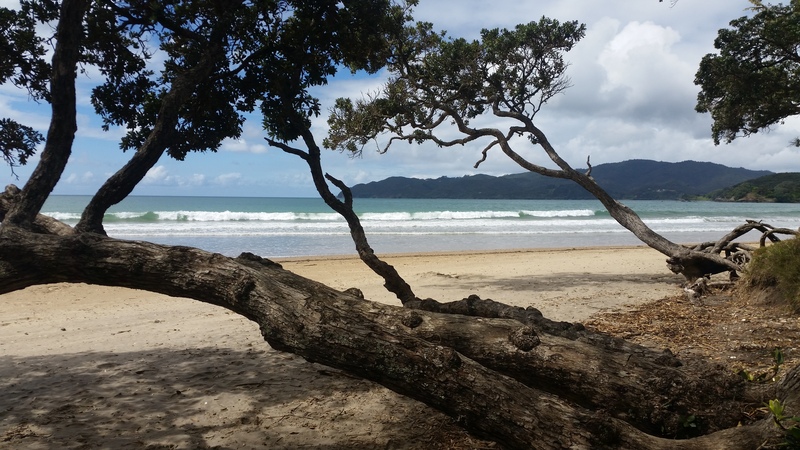 A beautiful trip with an opportunity to see the fantastic coastline into Picton. Our time staying in Nelson was the first taste of South Island, it’s a beautiful town, a cluster of hills with views over the ocean. 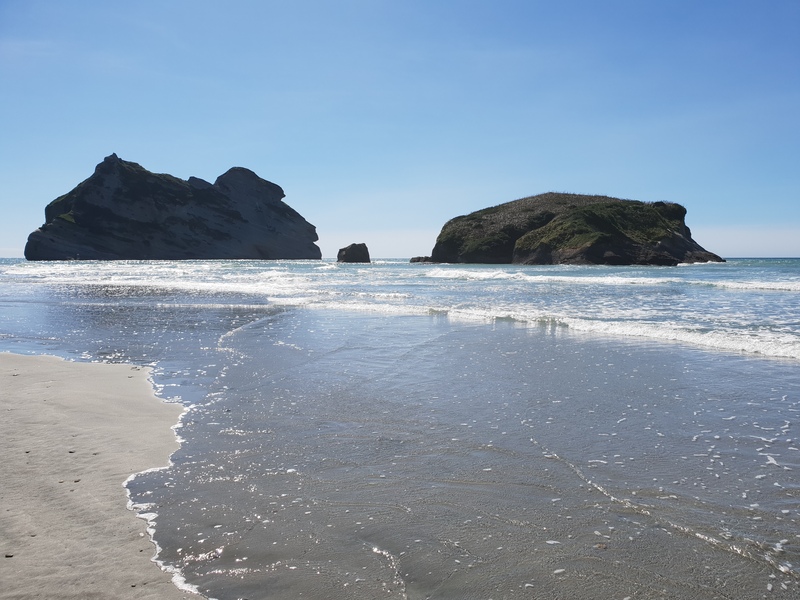 We especially enjoyed a trip through the vinyards out along the Golden Bay to Wharariki Beach. On the outskirts we discovered WOW, the Wearable Art Museum and there is an amazing collection of Classic cars too. It was time to move on and our next destination was Franz Josef Glacier. 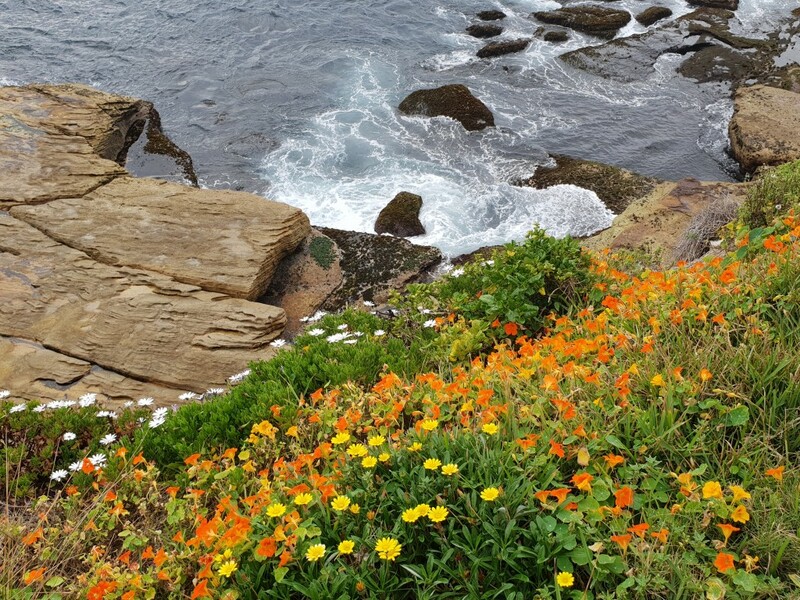 A drive down the wild west coast, we stopped at various points, for a picnic lunch overlooking the sea and several walks into the rainforests for embroidery inspiration. 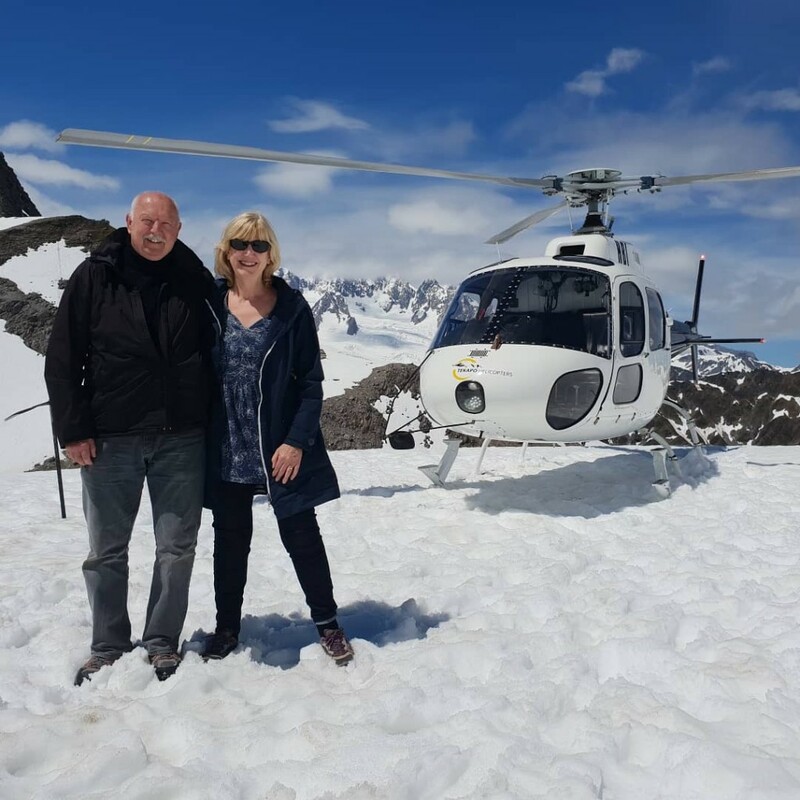 Finally arrived to stay a couple of days and the highlight was a helicopter flight. 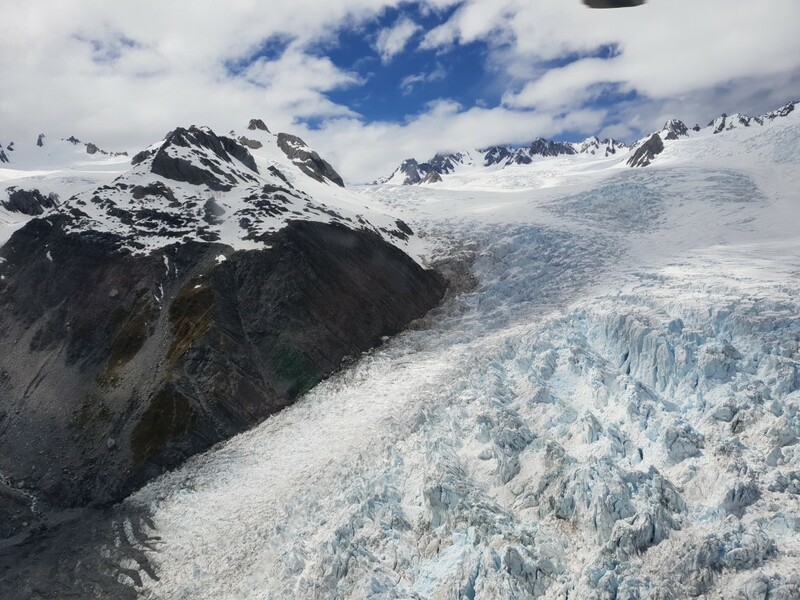 We went up to the snow capped mountains to land and then flew over Fox and Franz Josef to see the glaciers up close! Thrilling! The next drive took us further south over the Haast pass between Lake Wanaka and Lake Hawea to Queenstown and then to where we stayed, Te Anau. More beautiful scenery. Te Anau was our stopping point on the edge of Fiordland National Park for the planned trip to Milford Sound. This was to be one of the most amazing drives through a picturesque valley and boat trip along a majestic fjord. That’s for the next blog! 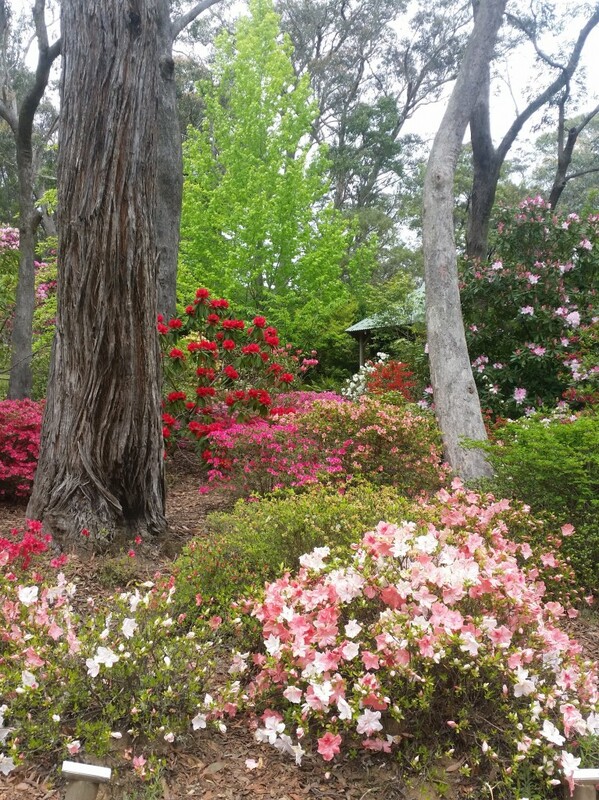 My trip continued with a stay in Melbourne teaching 2 classes at the weekends with a few days of relaxation in between. I started with a class for Carly Leech in Forest Hill called “Sunshine and Shadows”, exploring the unexpected colours found in shadows and the broad tonal range needed to give the images intensity and impact. There were some super results from the 2 day workshop, they are on the students work page on my website. Mid week I had the chance to visit The Heide Museum of Modern Art, to see a super exhibition by Mirka Mora “Pas des Deux” Drawings and Dolls. 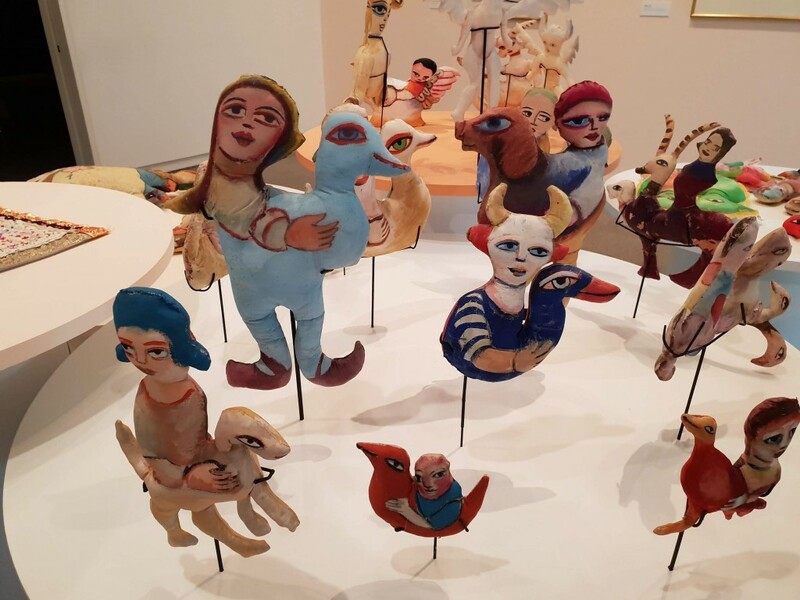 It is an extraordinary range of work, I especially loved the colourful fabric dolls she created. It was a great opportunity to see these as they are normally kept in the family home. 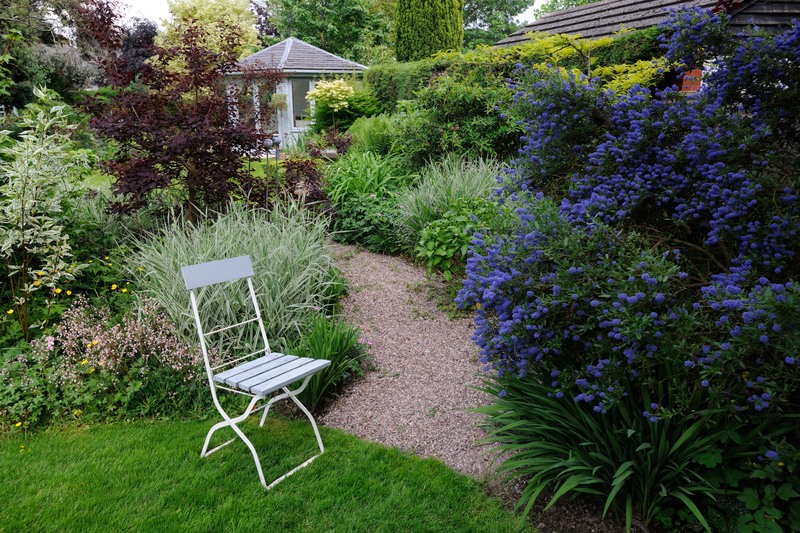 One of my favourite activities is garden browsing! 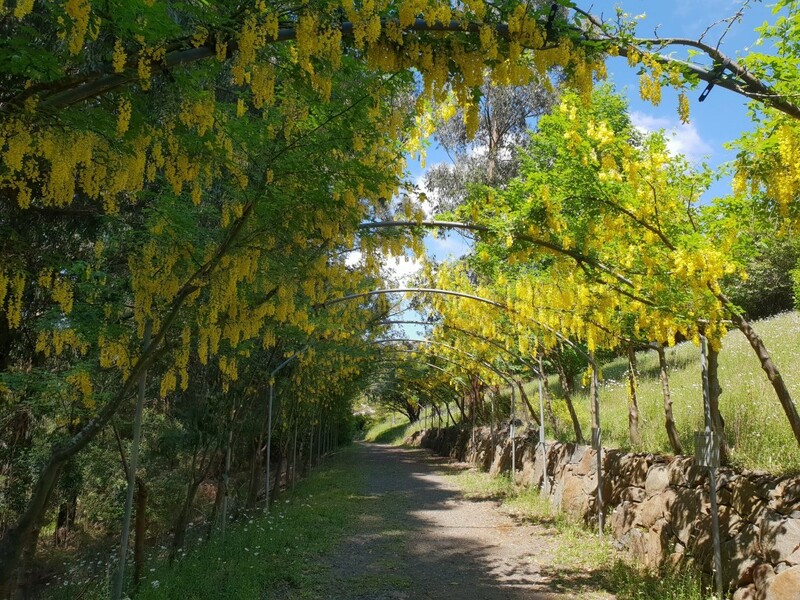 My lovely host did not disappoint with a local garden famous for its wisteria arch. 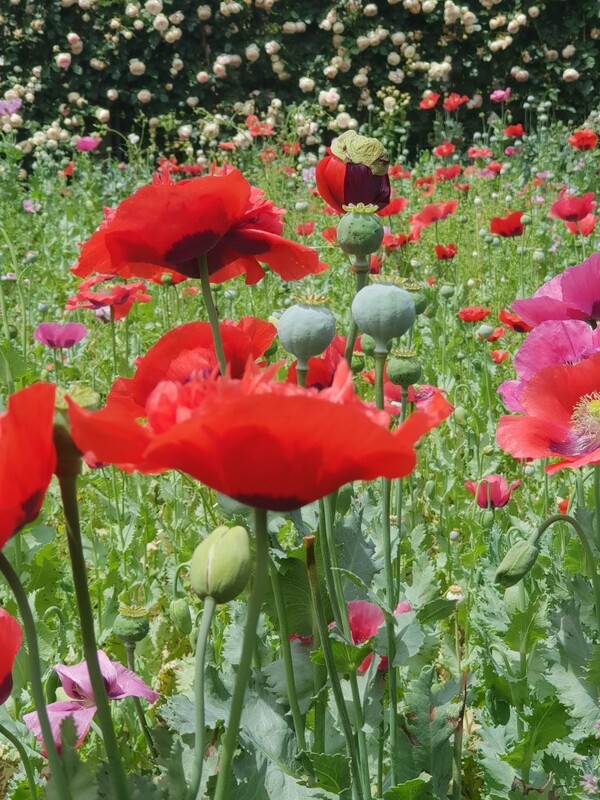 Unfortunately too late for that but the poppies were glorious! 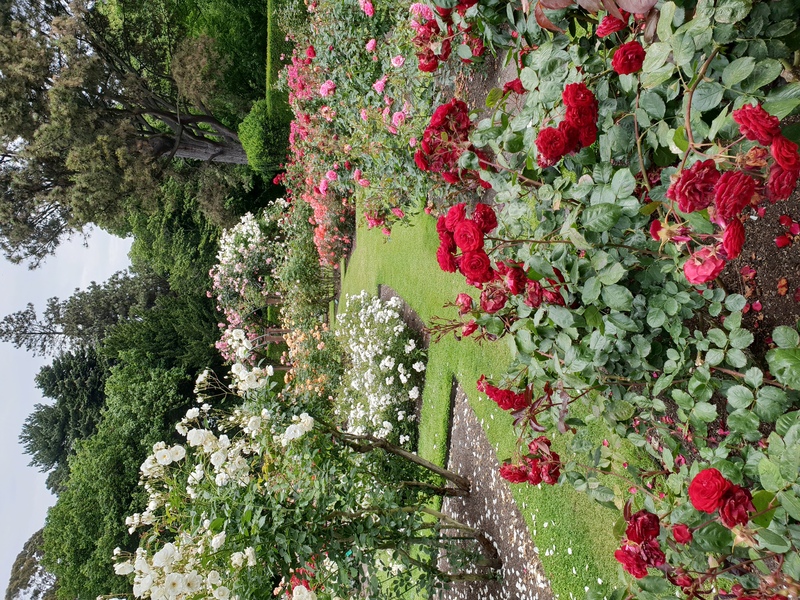 Another day out took me to the amazing National Rhododendron Gardens, a visual treat and really inspirational with a laburnam arch in full flower as well as azaleas and rhododendrons. My second weekend was teaching the Melbourne Guild the detailed flower study course “Up Close and Personal”. A great group of students in full creative mode produced some super results. 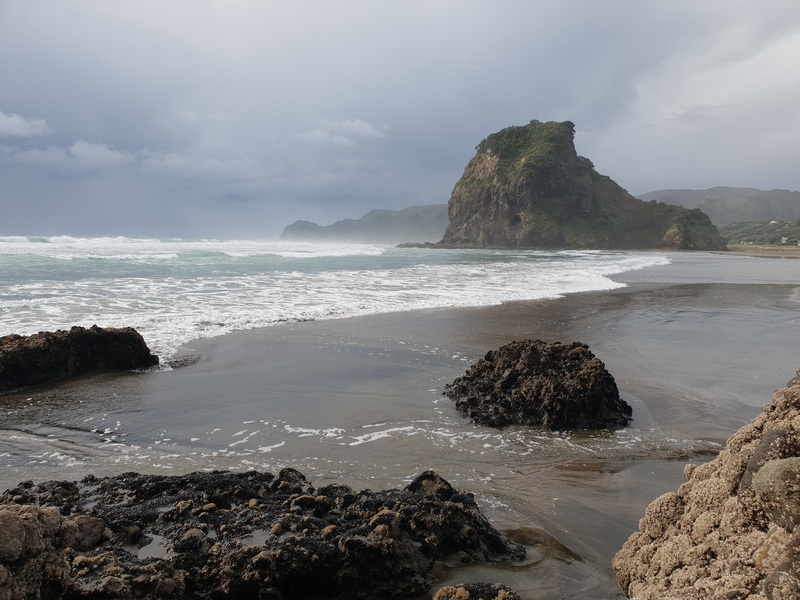 Starting with a few days in Auckland and from there a visit to Piha Beach. 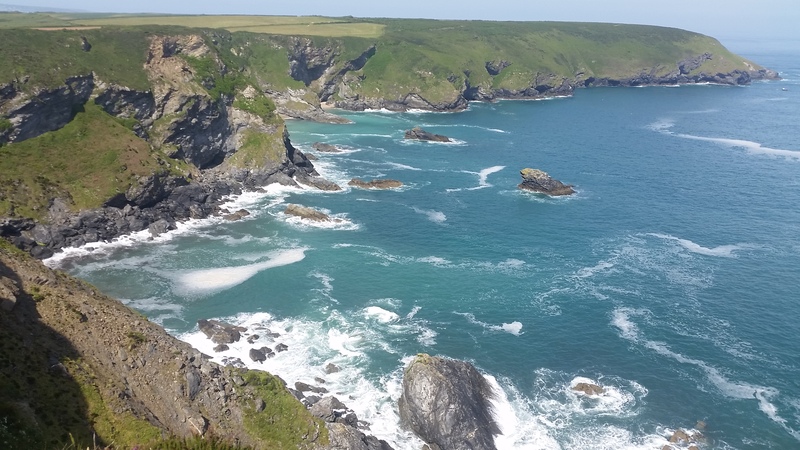 A stunning view from the headland above is tantalising and the walk along the beach was fabulous. So much inspiration for my embroideries when I get back home! It is famous as the location for the film “The Piano”. 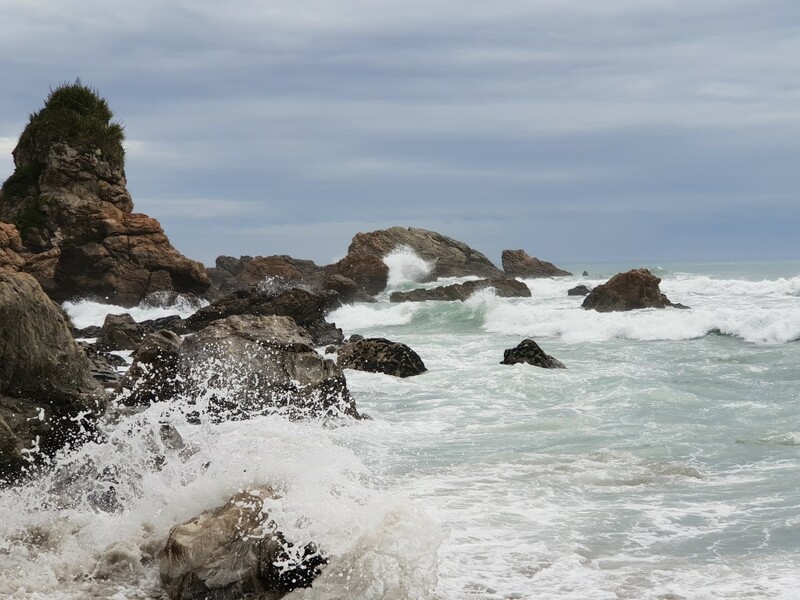 Powerful waves crashing against the rocks and a great sweeping curve at the waters edge gave me some great photos. 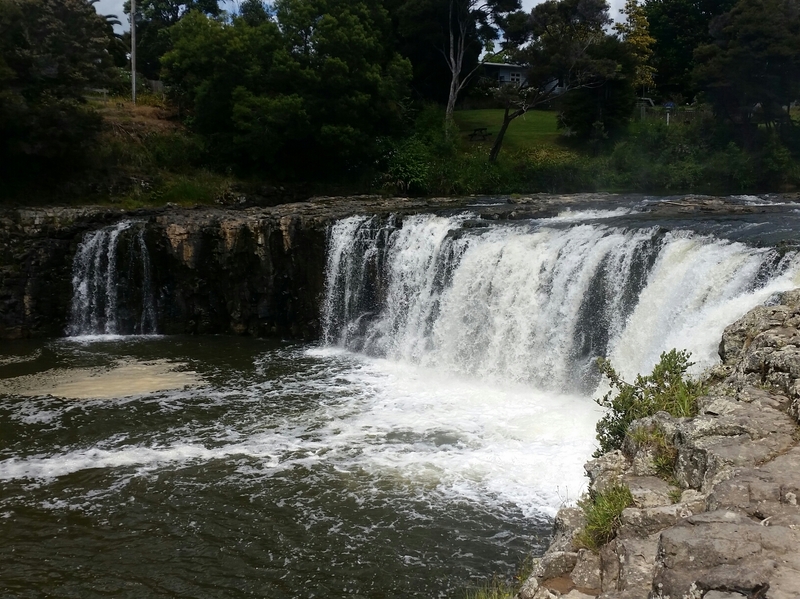 My adventures continue with a few days in Hawkes Bay staying near the beautiful town of Napier. I will tell all in my next blog post! It’s only been a week since I left the UK and it feels more like three. 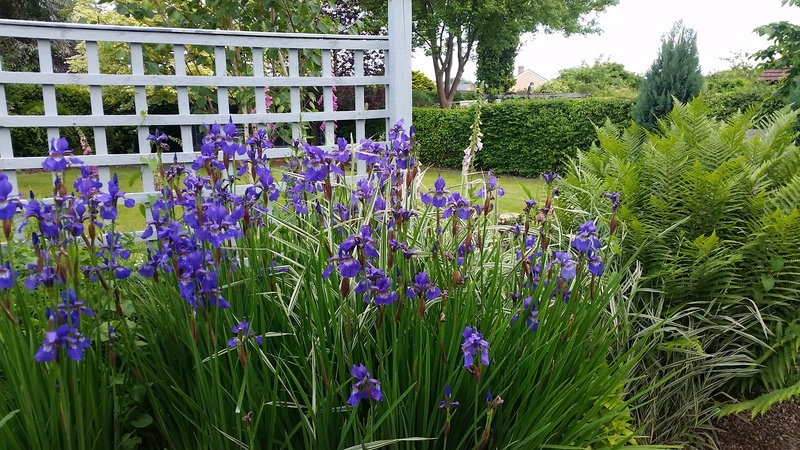 I arrived in Sydney and was met at the airport to be taken to stay with the President of Embroiderers Guild NSW in a calm, spacious house in Breakfast Point. Lucky me and a big thank you to Ron and Wendy. After a necessary day of rest I went into the Guild headquarters to hang my exhibition of 30 embroideries in their beautiful Gallery76. It’s on the top floor of their custom designed building, with great light and gleaming white walls. 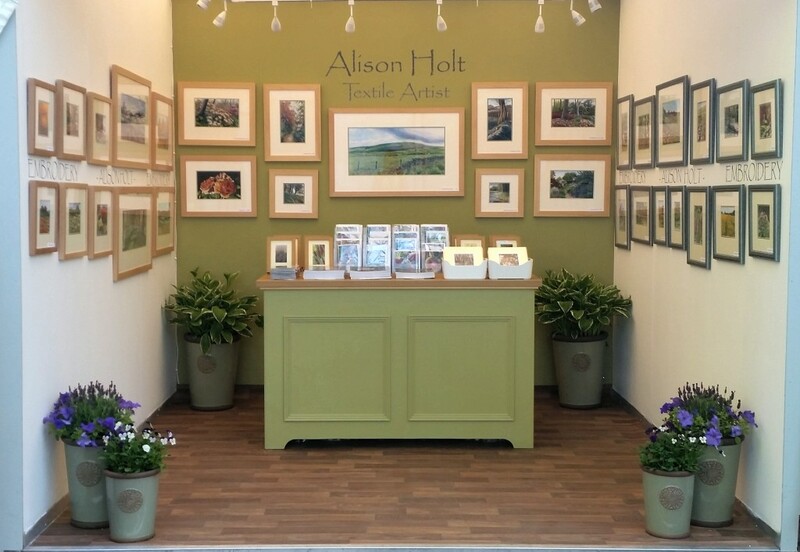 I had lots of help from April, their gallery curator and we were very pleased with the end result. They had kindly organised a launch that evening with wine and nibbles and with a little jet lag lingering I hope I made sense to all the people I spoke to! My course “Crashing Waves” started the next day and I had the weekend with a group of enthusiastic student’s. Their work is on my website. 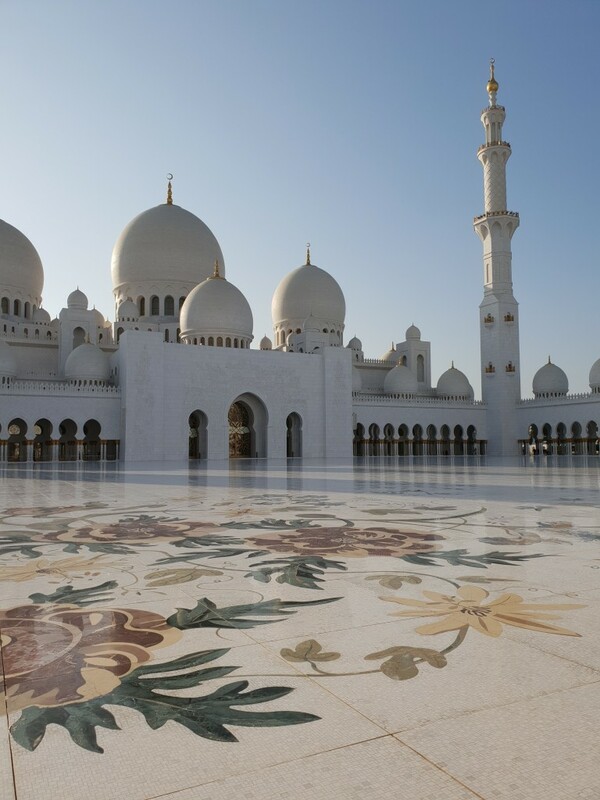 Please take a look, they made some great embroideries. I closed the weekend with a talk in the evening about my inspiration and process. Everyone seemed to enjoy it with many really insightful questions to end the session. One of the highlights of my week here is the purchase of a piece of my work by the Guild for their Collection. 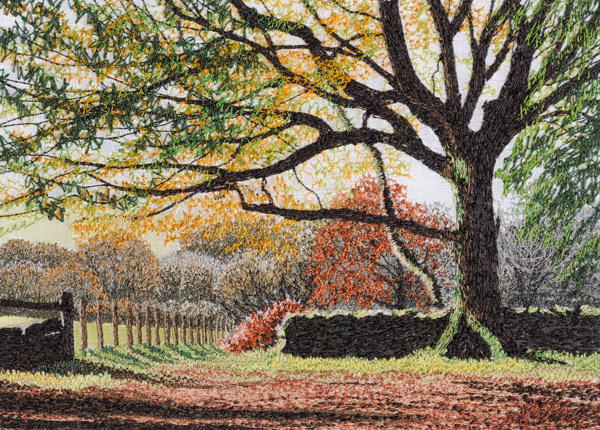 “Autumn Sunshine” is the piece and it will be housed in the Archive Room and be available for students to study and will be hung in Guild exhibitions. I feel honoured to have an embroidery of mine in their Collection, I am in esteemed company! I have been invited back to teach for the Guild in 2019, we are planning a weekend course in late October but also an additional Masterclass, I will keep you posted. I have had a couple of leisure days too. 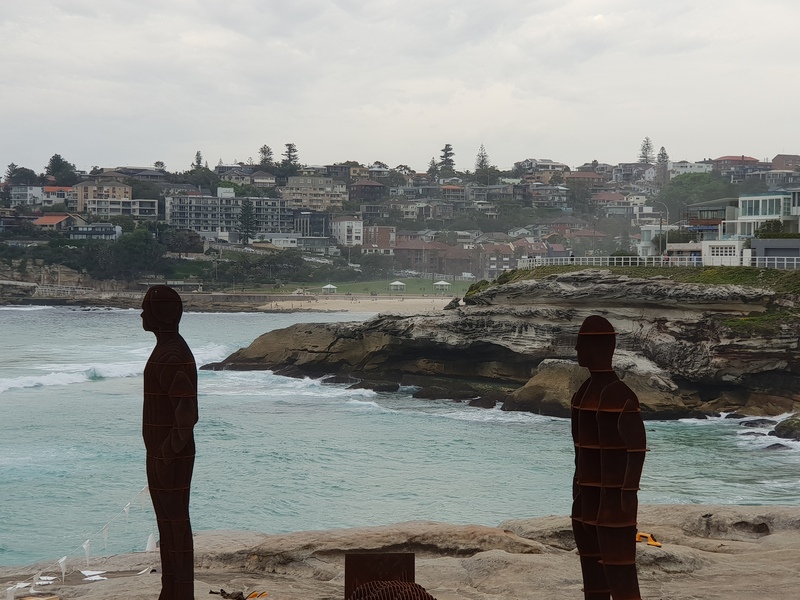 A trip to Bondi Beach for the cliff walk to Tamarama Beach. 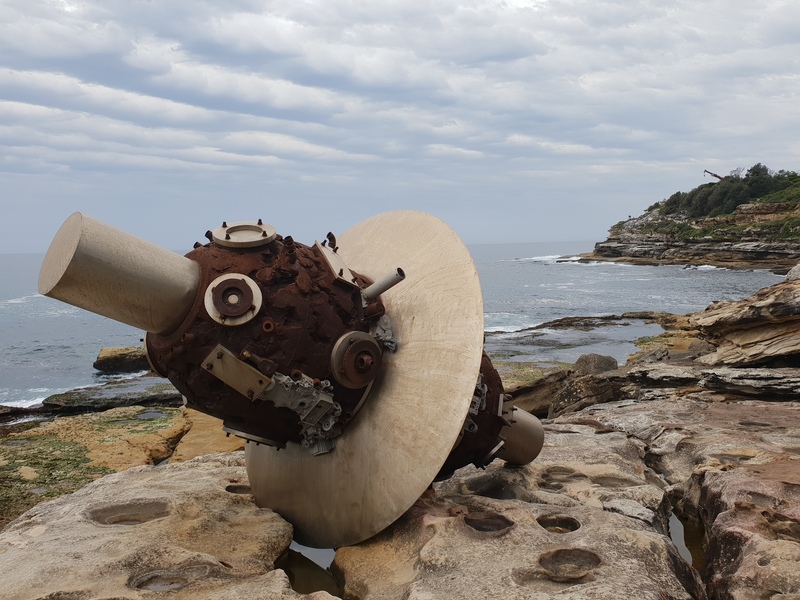 We thought we were too late for the Sculpture by the Sea but fortunately a few were still in place and they looked amazing in that rugged setting. 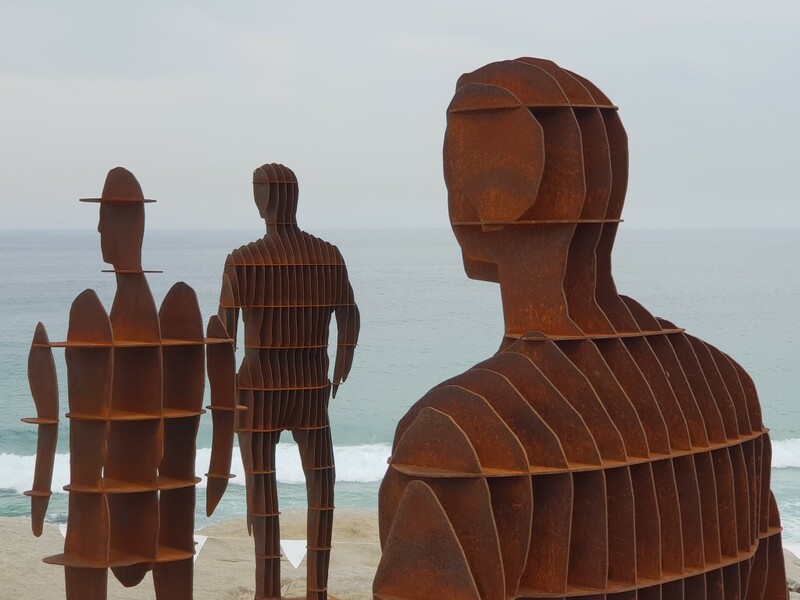 My trip here next year will be a little earlier and I will be able to see the full exhibition of sculptures, can’t wait! Only a couple more days for me here in Sydney then on to Melbourne for 2 more courses. I am really looking forward to catching up with friends there. From the Summer into Autumn! I really have enjoyed this great summer. I am fortunate to be able to open up the bi fold doors of my studio and keep cool. 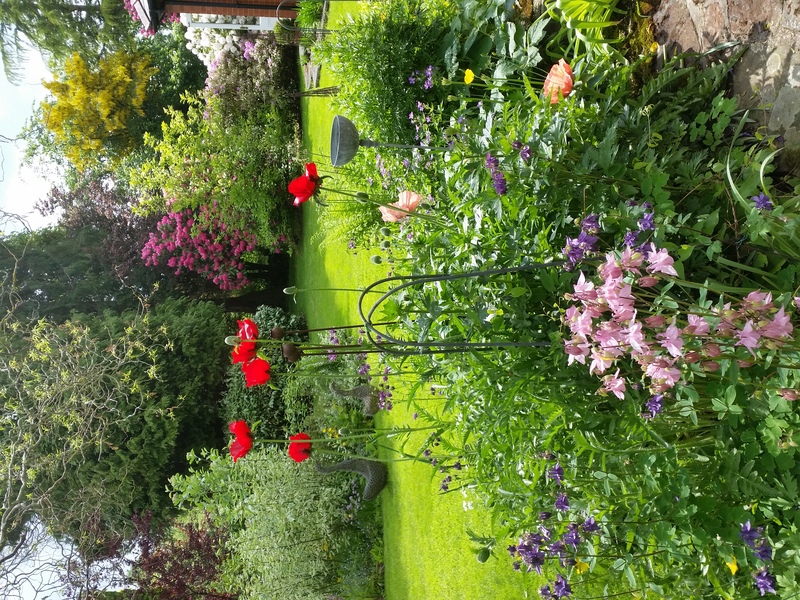 It feels great to let the garden and my workspace merge into one, especially when I have students there too. We have enjoyed lunches on the lawn and have to drag ourselves back in to the task in hand! 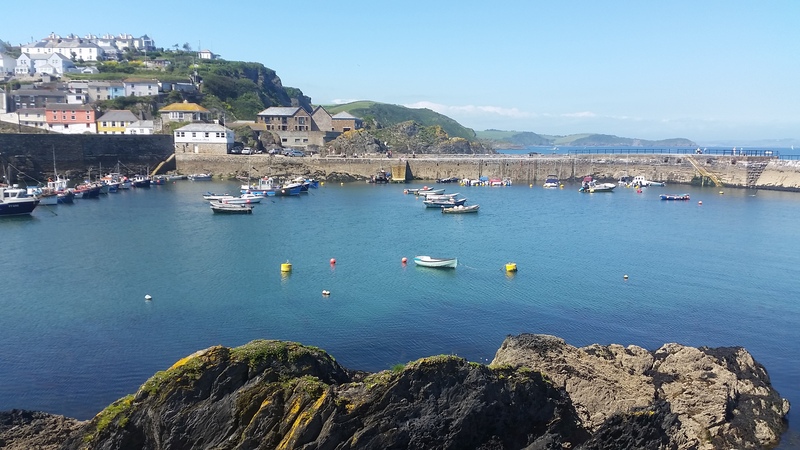 I have been teaching in some lovely locations too. 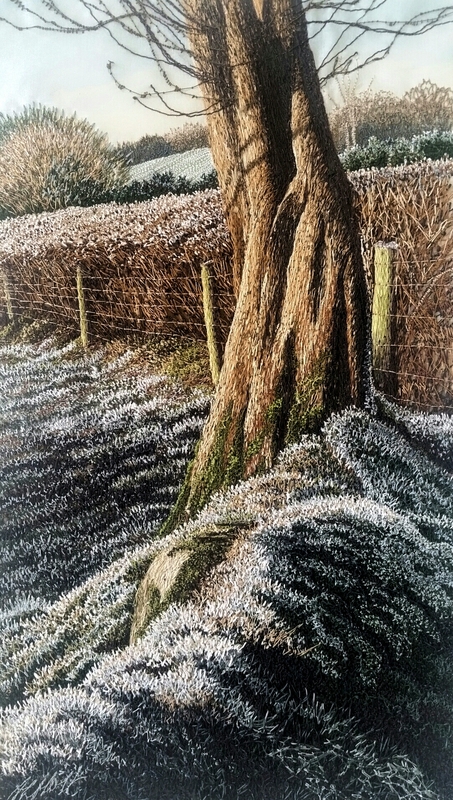 A residential course in deepest Dorset and “Etched in Frost” in sunny Brighton in July. Also several courses at home in Oswestry and the most recent in Harwich at The Old Bank Studios where “Flowers and Foliage” kept everyone busy and happy for 2 days. Celebrations in the Royal Academy! I have managed a bit of down time too. 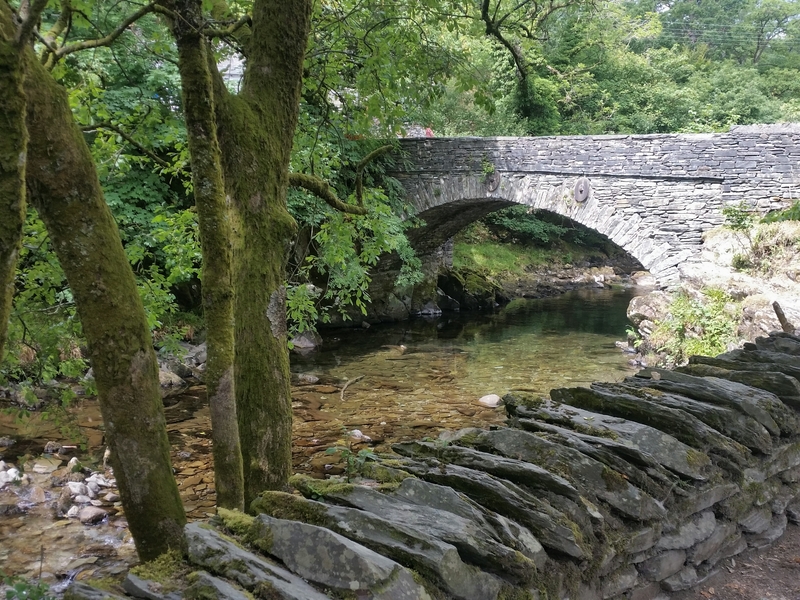 A few days in the Lakes was a highlight and a few trips to London. 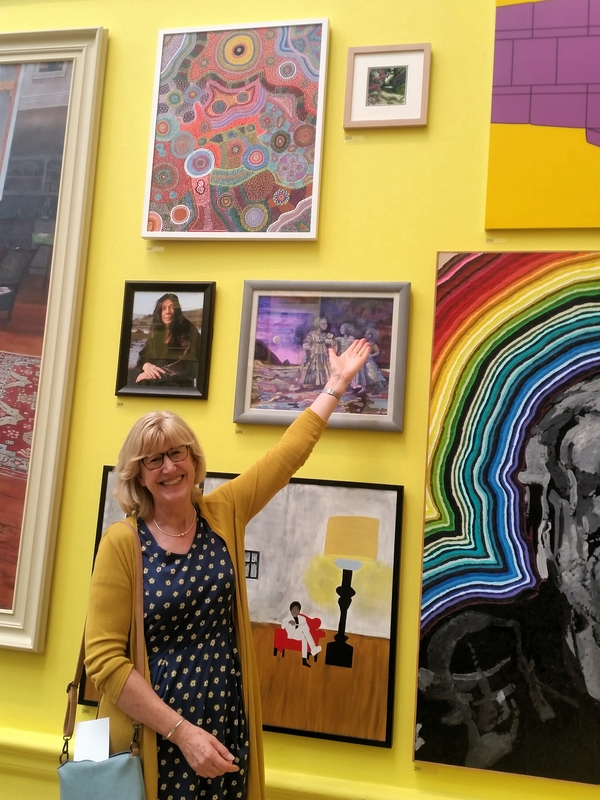 I felt I had to take advantage of my artwork being in the Royal Academy Summer Exhibition so went 4 times!! It has been so lovely to share the experience with friends and family. My next adventure is my annual trip to Australia. I will be teaching in Melbourne and in Sydney, where I will also give a lecture and have an exhibition of new embroideries. 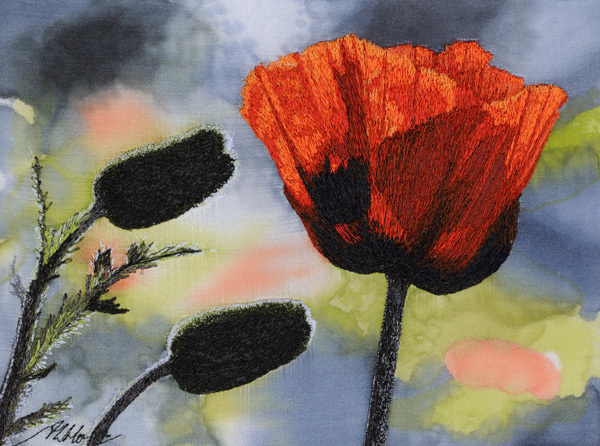 It will be at Gallery76 which is in the Embroiderers Guild Headquarters NSW. More details of rimes and dates on my courses page. I will also be teaching again in Hastings NZ as part of my trip. Here is a sneak preview of some of my new work. 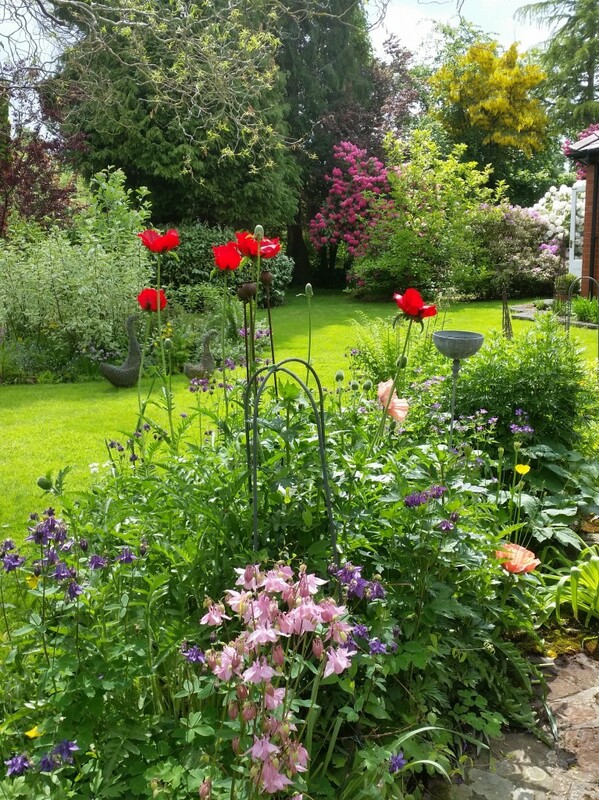 We are into April…finally Spring! Too busy to write a blog is a poor excuse but it has been a very full diary for me these past 2 months! I have had lots of studio time, teaching, planning and travelling. I have my flights booked for Australia and New Zealand for this November, I am excited to be going again, this is my 6th year in a row! 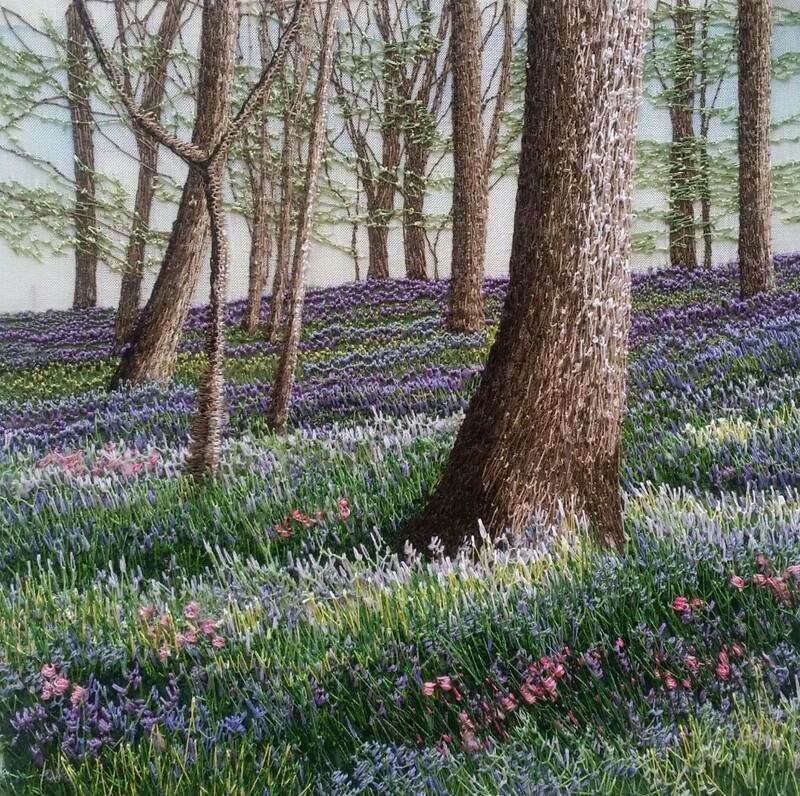 I will be in Sydney to teach, lecture and exhibit my embroideries at NSW Embroiderers Headquarters. Also Melbourne and Hastings, NZ. teaching a range of courses. Full details on my courses/Australia page. It was a terrific experience in a fascinating country. We stayed in 5 different locations and saw some wonderful sights. 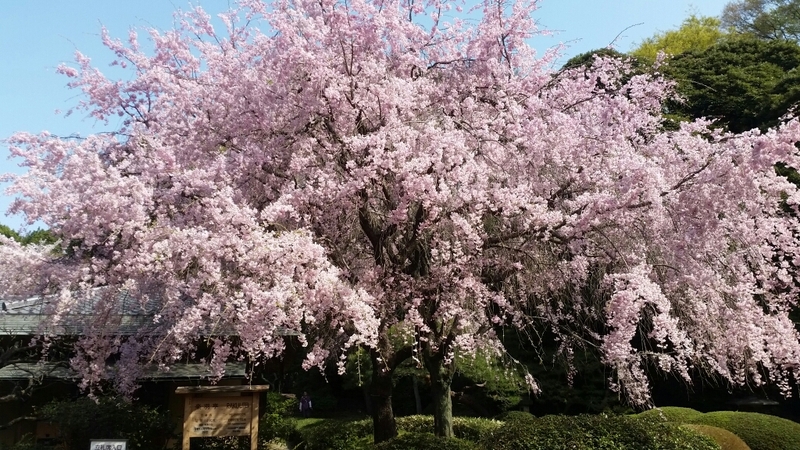 We coincided with the cherry blossom time which made the first week very special. 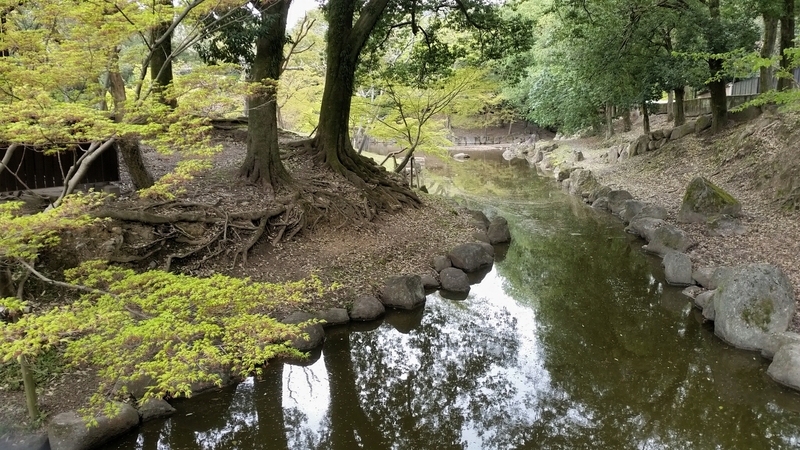 Starting the trip with a few days in Tokyo visiting temples, shrines and so many beautiful gardens was a great introduction to Japan. 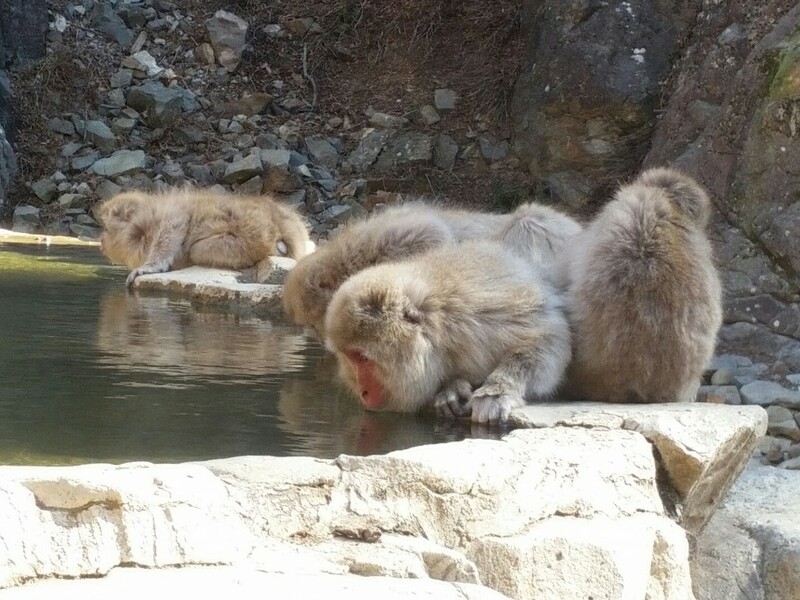 From there we took a day trip to see the Snow Monkeys in Nagano. They are wonderful to see in their family groups. 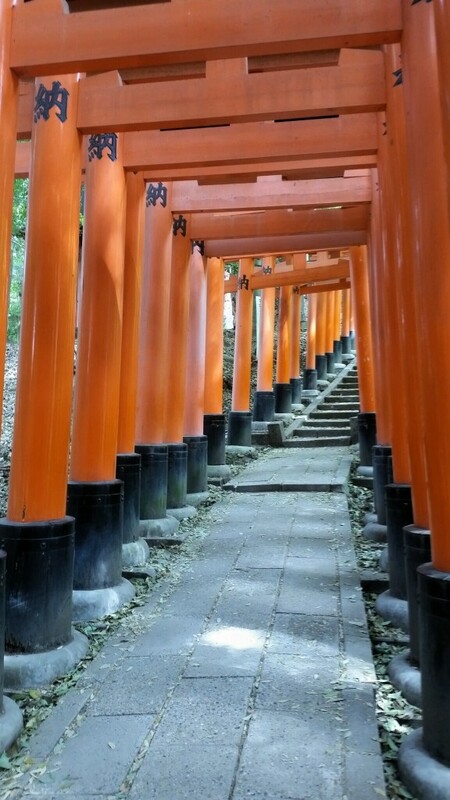 Our next destination was Hakone for some gorgeous scenery and an amazing sculpture park. 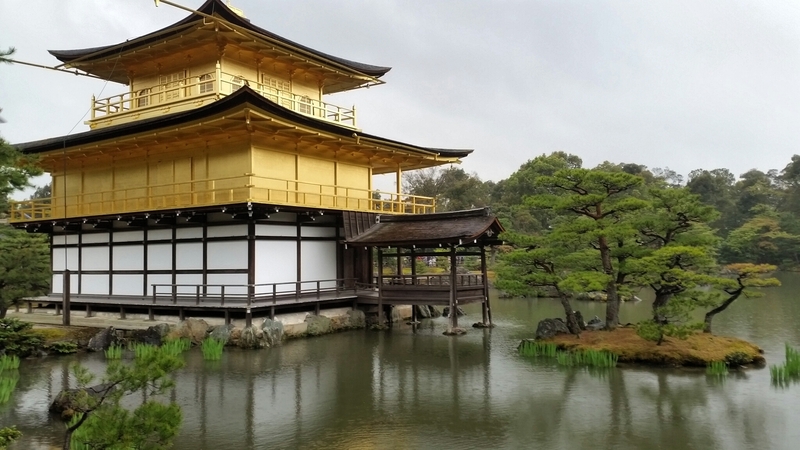 Another train journey took us on to stay with a lovely Japanese family in Kyoto, a beautiful experience in a fascinating city and finally Osaka with its neon city lights and great street food. 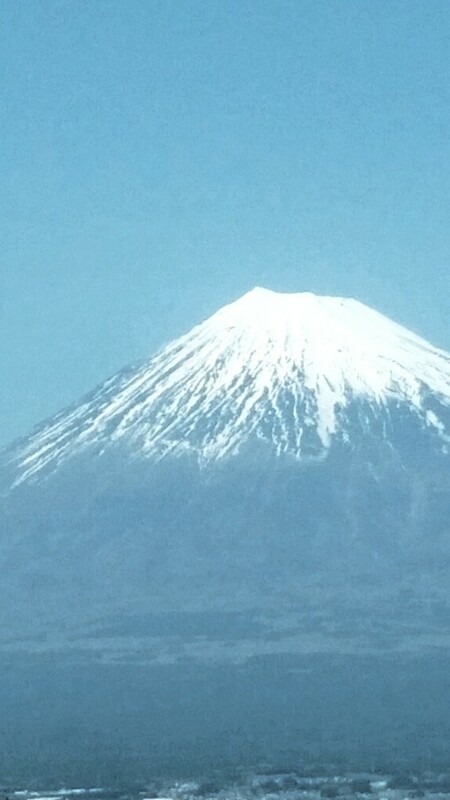 We got to see Mount Fuji too! 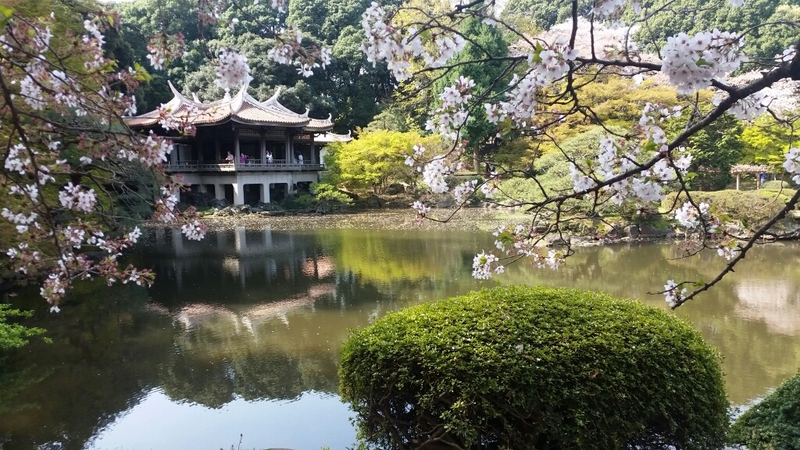 I took many photographs on the trip and I am very excited to create some cherry blossom embroideries. If I hurry up I may have one in time for Chelsea. 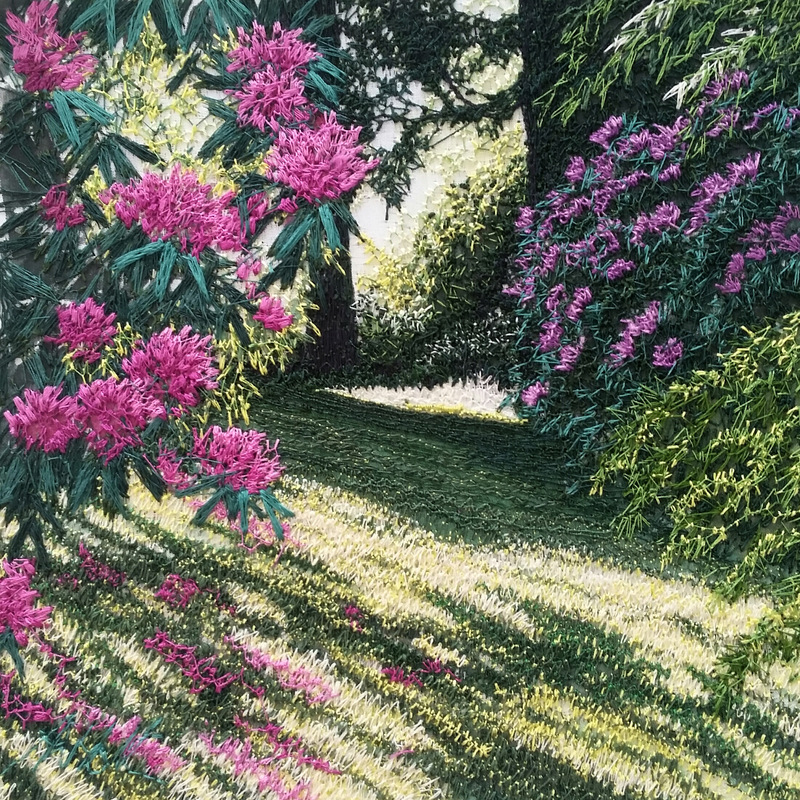 The embroidery I submitted to the RA Summer Exhibition has got through to the next stage so it will be going down to London on May 10th to go in front of the Judges. A way to go yet but I have got further than last year. Wish me luck! 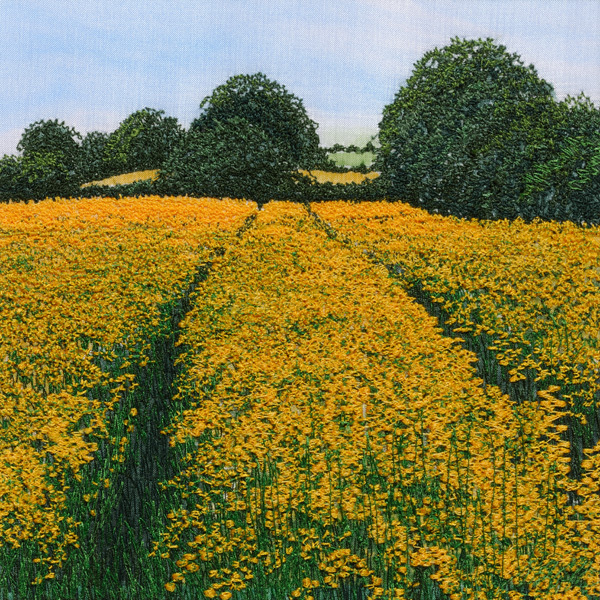 One of my embroideries (“Amongst the Linseed”, see previous blog post) has been bought by Diana Springall to be included in her extensive collection. http://www.dianaspringallcollection.co.uk/ Lovely to be in in such esteemed company. Work continues at speed for Chelsea Flower Show with only 5 weeks to go, trying not to panic. A new colour scheme this year so the paint brushes will be out to give new life to my sale counter! I hope to see you there! 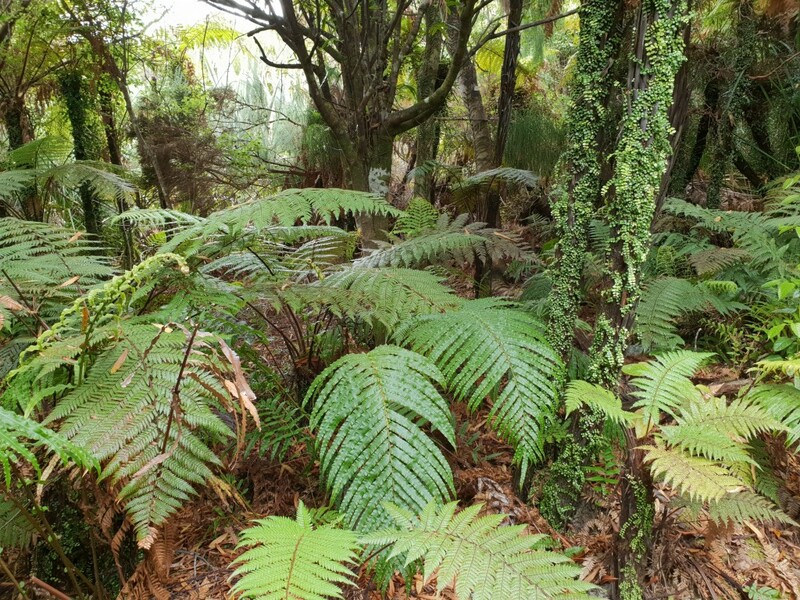 This is the second blog of my Aussie/NZ trip. 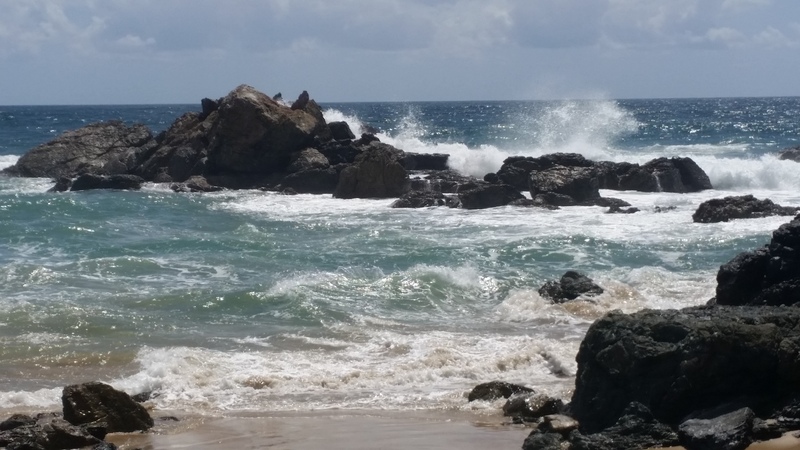 I spent a great week in Port Macquarie NSW. teaching 2 courses, “Seascapes” and “Up Close and Personal” with Jenny at Stitched ‘n’ Framed. A lovely well lit, spacious workshop room above the colourful fully stocked patchwork and quilting shop. Some students signed up for both courses and really built on their silk and thread painting skills. The work is on the students work page, please take a look! 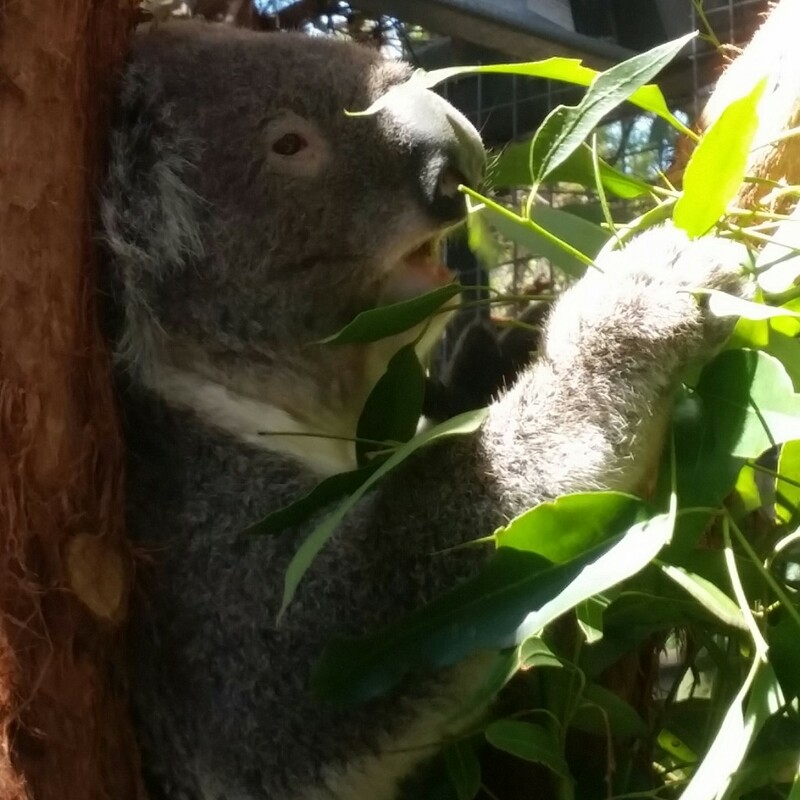 I had a couple of days off between teaching and explored the area visiting the Koala hospital, a winery or 2, Coffs Harbour, Urunga, Crescent Head and the beautiful Bellingen Valley (Thank you Diane for that recommendation! ) 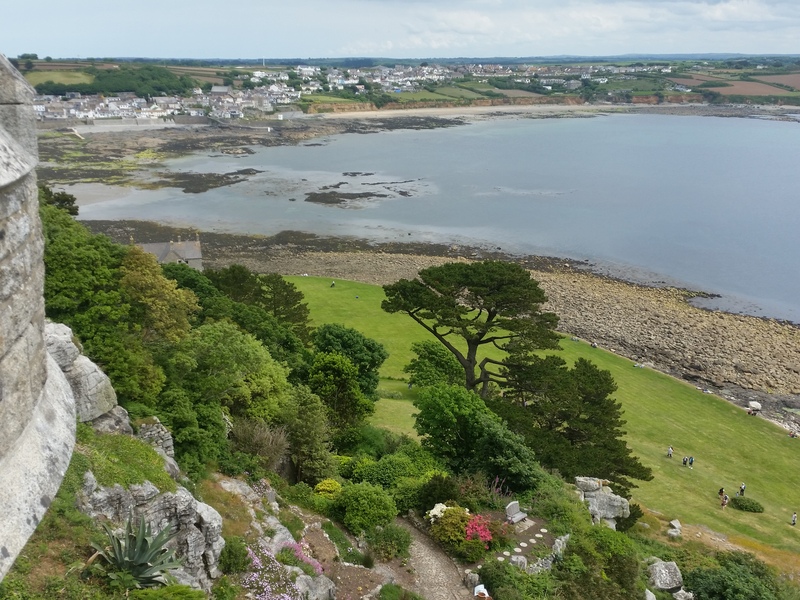 its a beautiful area and I loved the coastline too. So after 4 weeks and 5 courses it was time to say goodbye to Australia and be very grateful for such great experiences yet again. Thank you everyone who made it so special, see you next year! 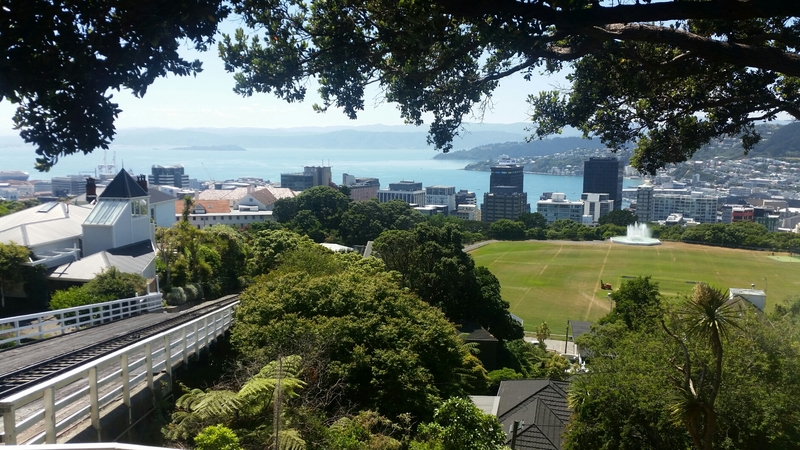 The next stage of my trip was to fly to New Zealand. Driving out of Auckland I could see the difference in the colours of the landscape immediately, lush bright greens and a more European feel to the scenery. Absolutely beautiful. 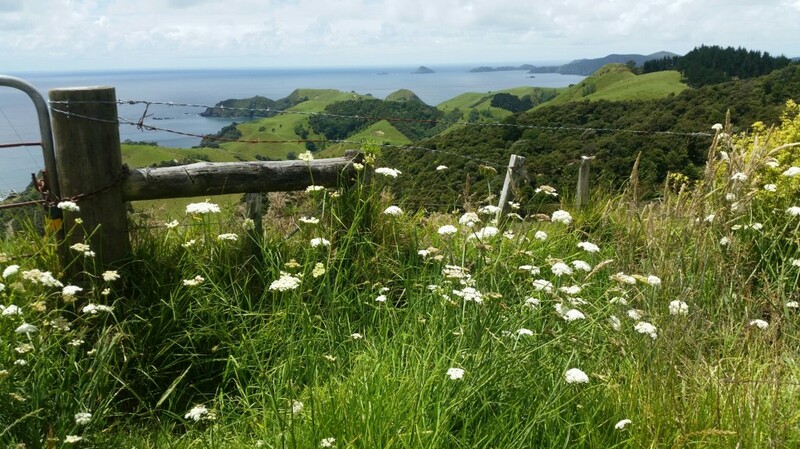 We travelled north to stay in the Bay of Islands for a few days. 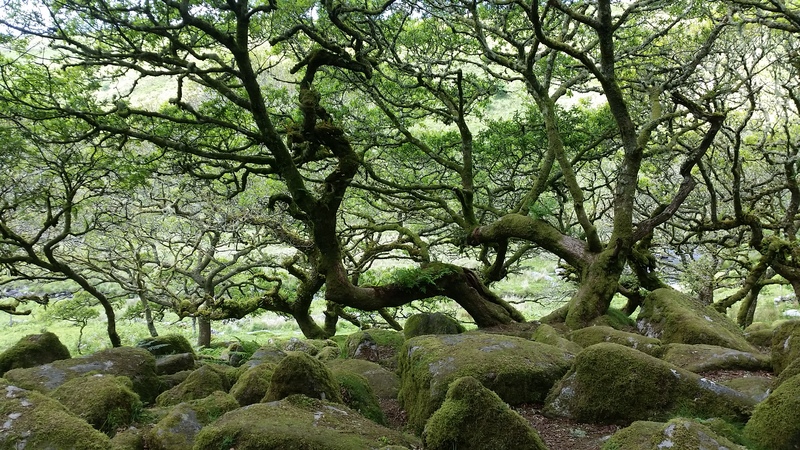 A wonderfully inspiring area, so lots of photography opportunities and a wealth of ideas for new embroideries. 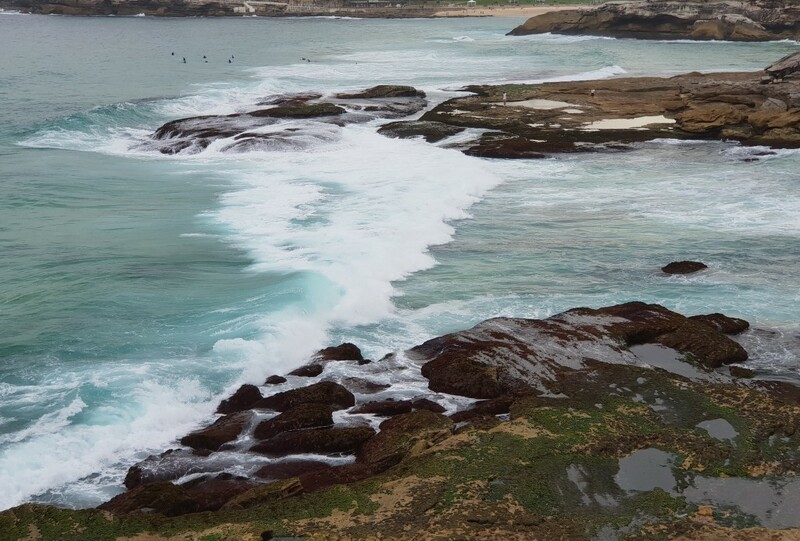 We found waterfalls and an amazing coastline with dramatic surf and empty beaches. 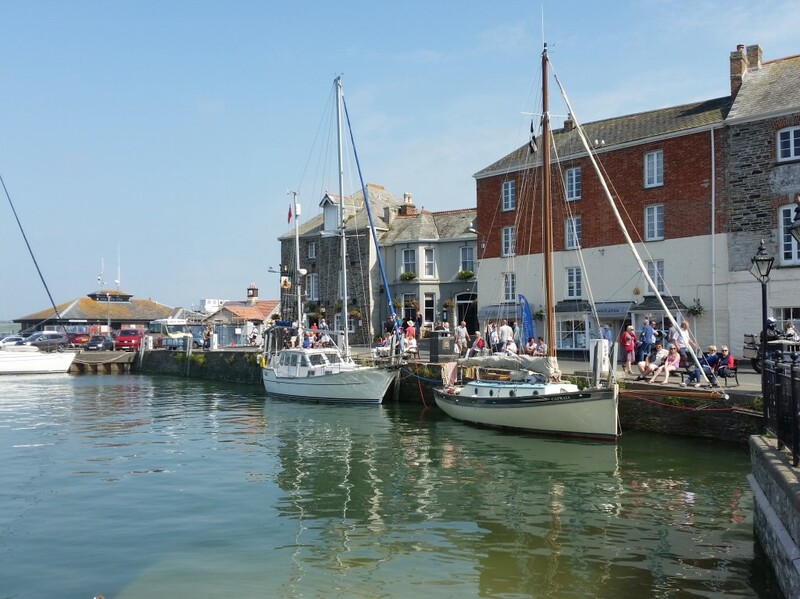 We were fortunate with the weather too and had sunny days to explore a lot of the area. 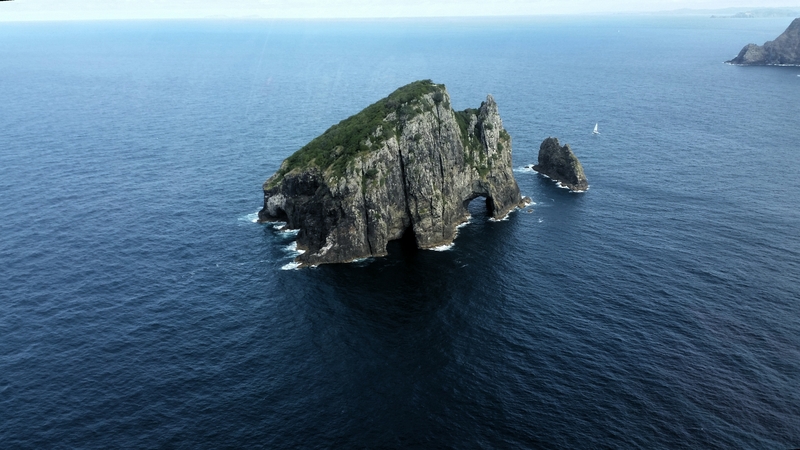 The highlight of the week was a helicopter ride from Paihia out to the Hole in the Rock, one of the 144 islands, which has a distinctive hole in it large enough for boats to go through. 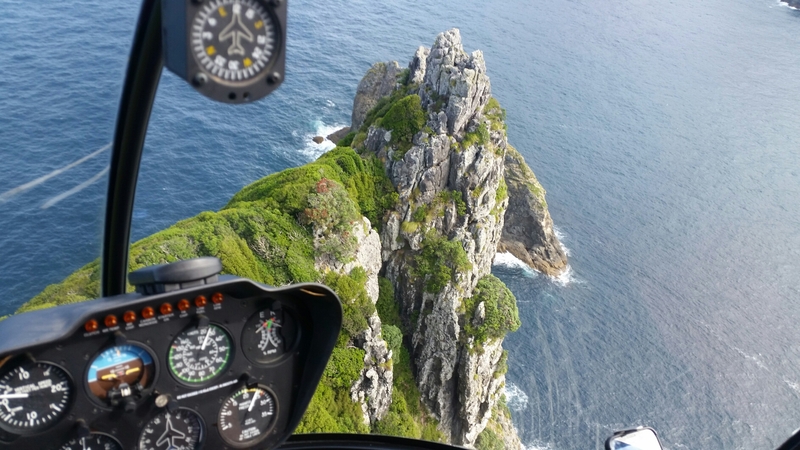 It was a stunning visual treat and landing on the Rock was exhilarating. 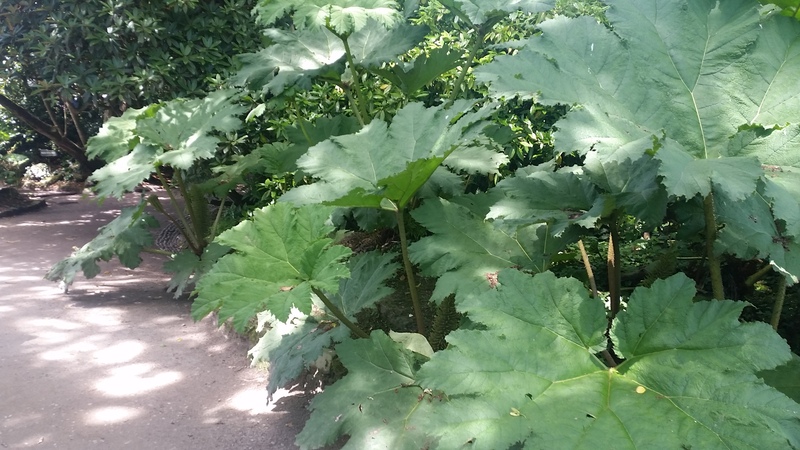 We had the chance to walk into the bush on the top to experience the lush vegetation first hand. It was a fantastic experience, memories are made of this! It was soon time to get back to work so that meant heading south to Hastings for the weekend and meeting up with Georgina Campbell and her lovely family. 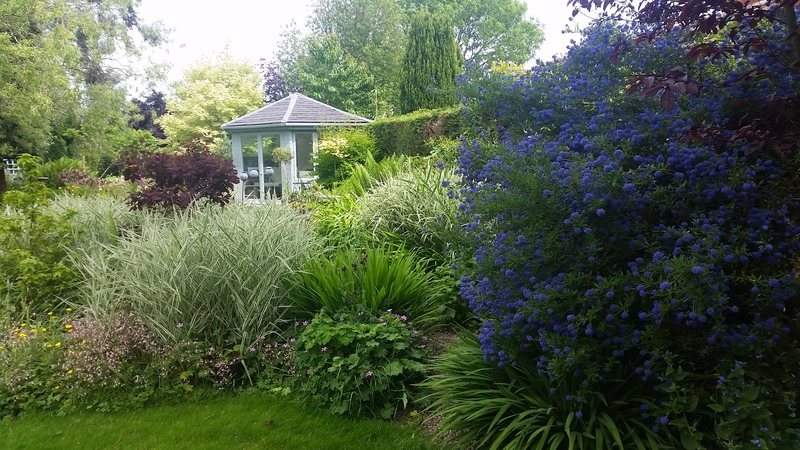 We had a “Flowers and Foliage” course organised and 16 eager students to meet! It all ran smoothly and we had a lot of fun, what a great weekend. For my first teaching experience in NZ I couldn’t have asked for more. 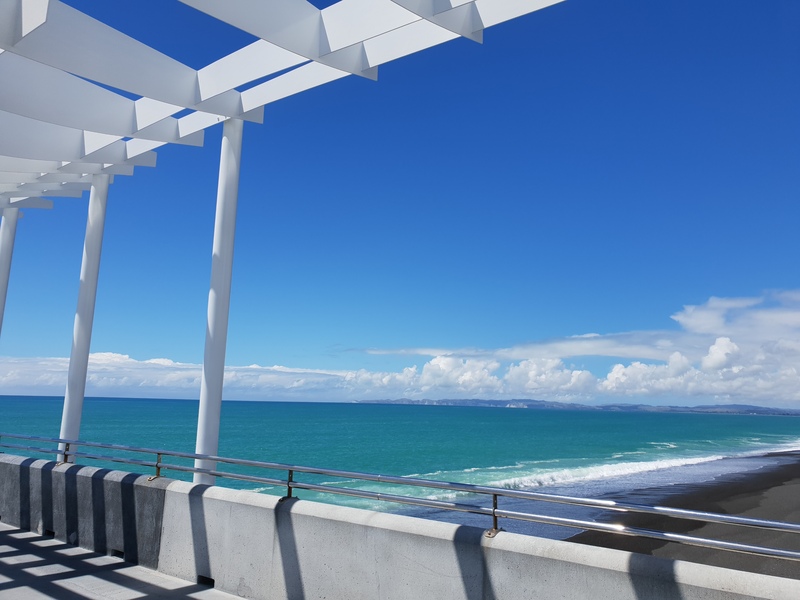 Napier is a charming town near Hastings, it has lots of Art Deco architecture, outdoor cafes, a long promenade and pier and was a delightful place to visit on my day off. 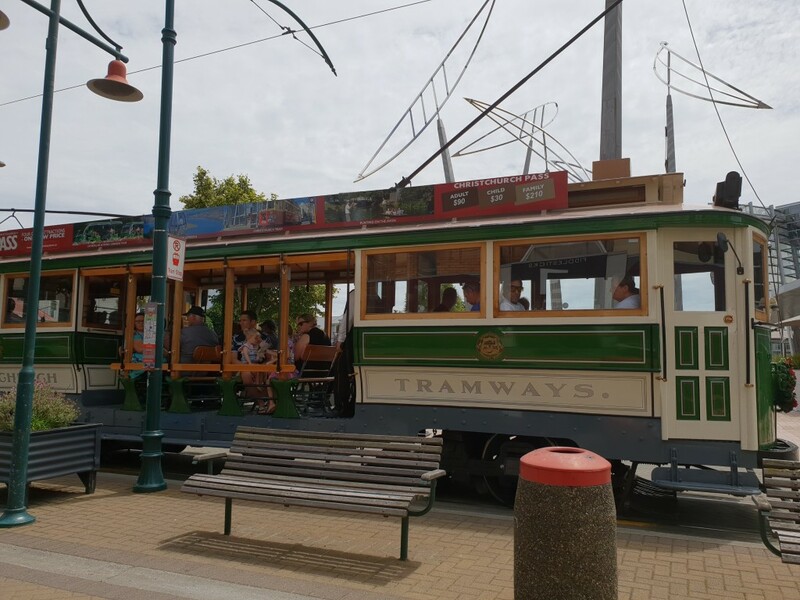 The final stay in NZ was in Wellington, in Lyall Bay, south of the city, morning walks on the beach and an easy bus ride into the centre of Wellington meant we had the best of both worlds. 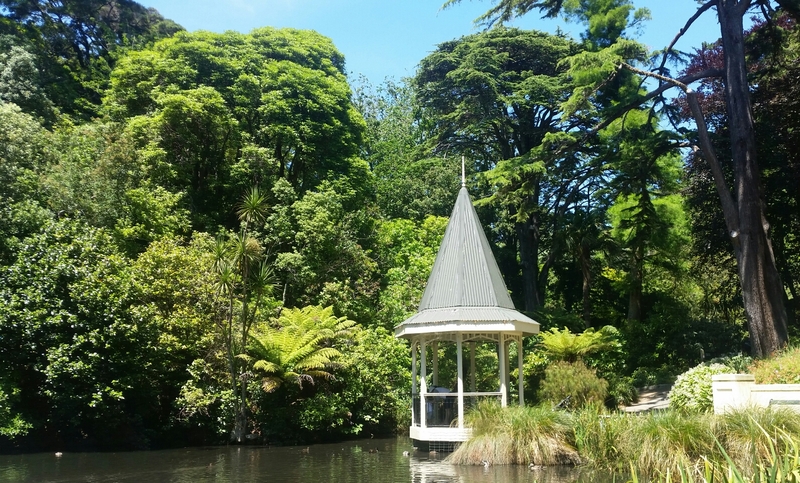 We enjoyed the Cable Car and Botanical Gardens, exploring the beaches and seeing 2 blue penguins! Finally it was time to leave NZ and head home. A stop over in Hong Kong was great fun. It’s a busy frenetic city with lots to see. 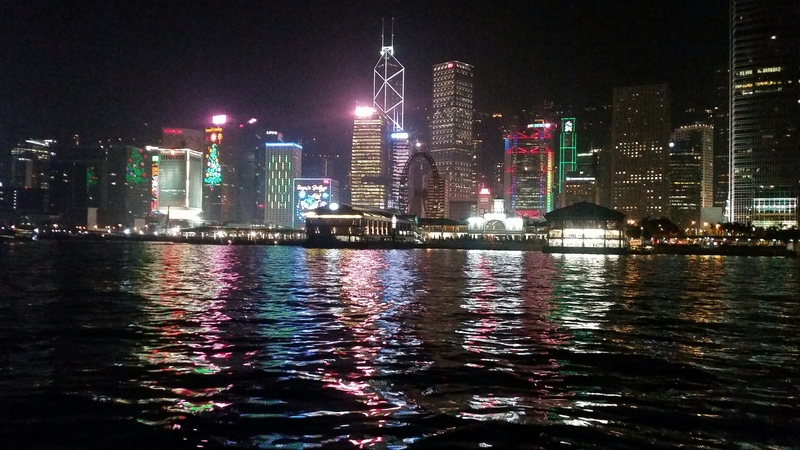 We experienced excellent food in bustling street markets, a trip up to the Peak for the incredible views and a ride on the Star Ferry over to Kowloon to see all the city lit up with Christmas lights. 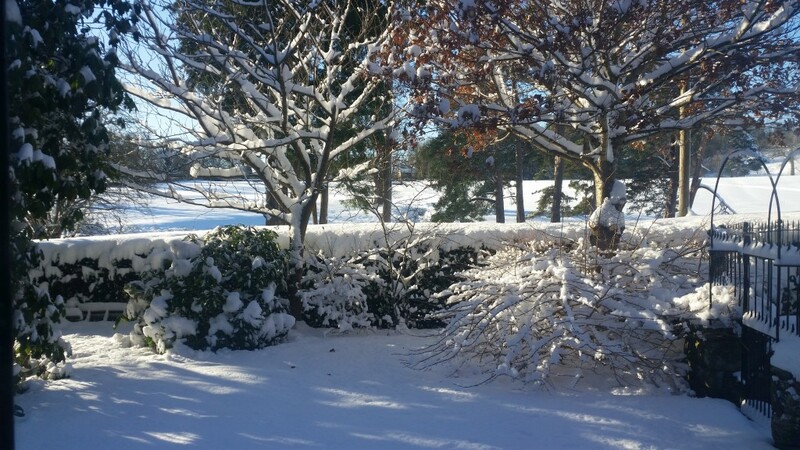 I arrived home to face the biggest snow fall for years. Minus 16 degrees in parts of Shropshire, what a shock to the system! However it’s great to be home, to see friends and family and plan a quiet Christmas. That’s enough excitement for me…well until next year! This is the first of 2 blog posts, for this, my 5th trip to Australia. I have completed the first leg of the journey with my stay in WA. 3 courses taught so far, lots of lovely enthusiastic ladies eager to learn. Much to my delight some familiar faces from my previous trip had signed up for another course, some travelling from out of state to join me in Perth. This has been the busiest spell out of the 6 weeks, with 7 days teaching in 10 days. ( No sympathy needed but it was full on!) The weather has been over 30 degrees each day since I arrived, a sharp contrast to the weather I left behind in the UK. I have been fed and watered very well in each place I have stayed. Great hosts, thank you! It’s a bonding experience organising courses and the logistics so a glass or two of wine in the evening is a great way to ponder on the successes of the day! The students work is posted on the website and I am thrilled with the standard of work. A team effort on each occasion as the students listen attentively and work hard on their projects to achieve such great results. 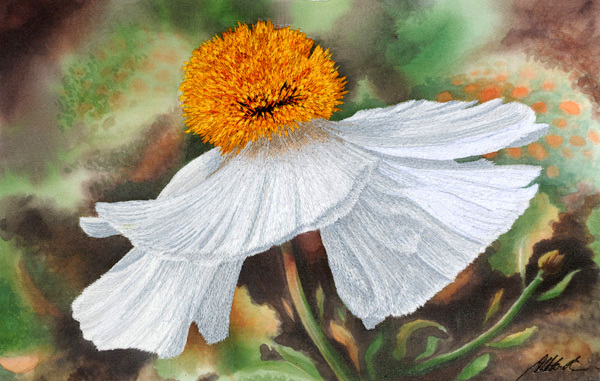 Here is a piece by Jill, a student on the “Up Close and Personal” course in Margaret River. Wendy demonstrates the sound proofed folding doors between the 2 classrooms on the top floor, making it into 1 large room. 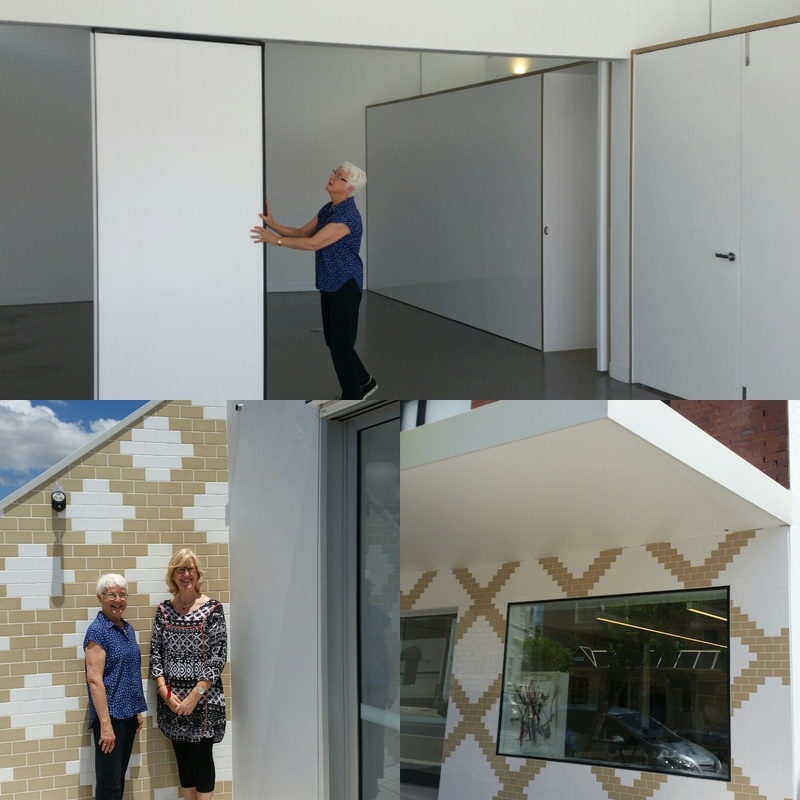 While in Sydney I was invited to the headquarters of the Embroiderers’ Guild NSW to see the rebuild. I had an exciting tour with President Wendy Schmid as the building was being signed off by the architect and building inspectors. Wow! What an amazing custom built space. Several beautifully lit workshop rooms. A library and archive room. 4 gallery spaces, meeting rooms and shop. Over 3 floors this new place is fabulous. 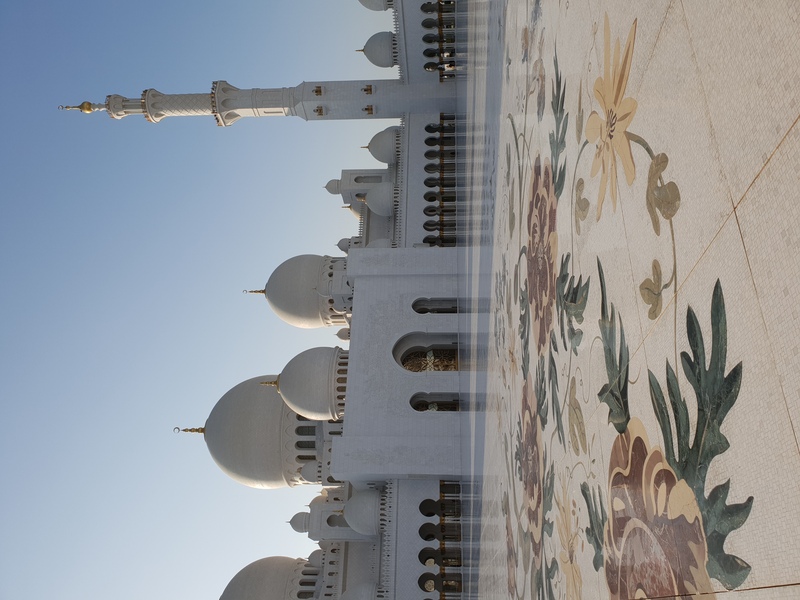 The details are lovely, especially the cross stitch inspired patterns of the tiles! 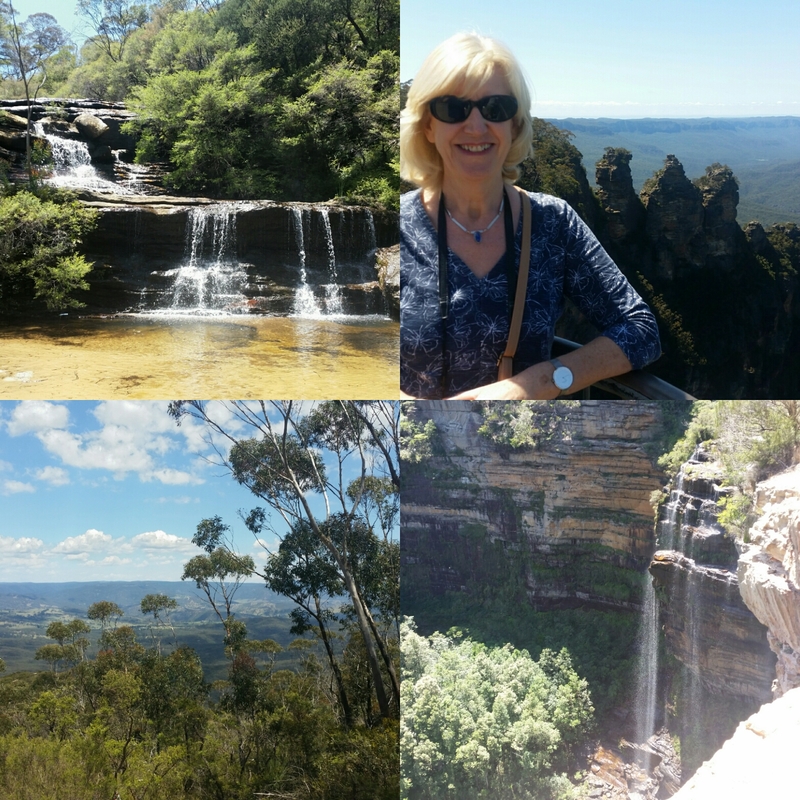 I am currently enjoying a few days in the Blue Mountains. 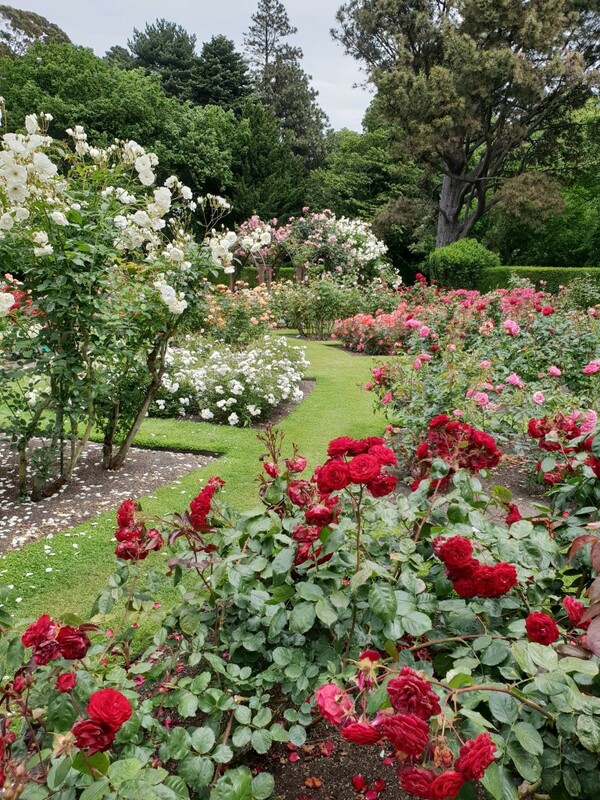 The scenery and gardens are wonderful and I am feeling inspired for some new work when I get back in my studio. 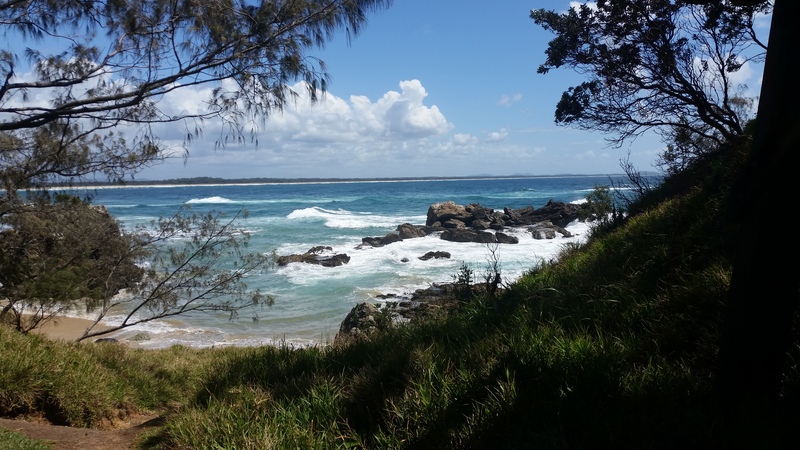 Next stage is to drive on to Port Macquarie for my next couple of courses. I am about to leave on my 5th trip to Australia. It has become an autumn ritual for me heading ‘down under’ to teach a range of courses just as the temperature drops here in the UK! Great timing! I then move down to Margaret River for the second course, which is called ‘Up Close and Personal’, the detailed study of flowers. I head north again back to Perth for the third course ‘Sunlight and Shadows’ looking at broad tonal ranges in the landscape. It is a varied range of courses to start the trip. So after 2 weeks in WA I fly to Sydney and from there will spend a few days in the Blue Mountains. A well earned rest to recharge my batteries I think! 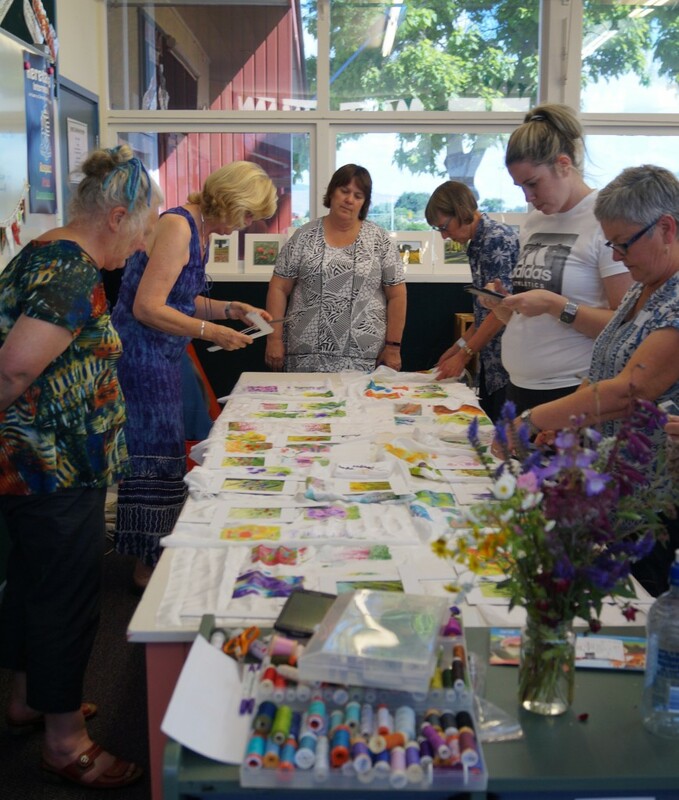 My final destination in Australia is Port Macquarie, on the coast north of Sydney, I will teach 2 more courses at Stitched n Framed, ‘Seascapes’ and ‘Up Close and Personal’ for the second time. The final leg of the journey, and a new experience for me is New Zealand. 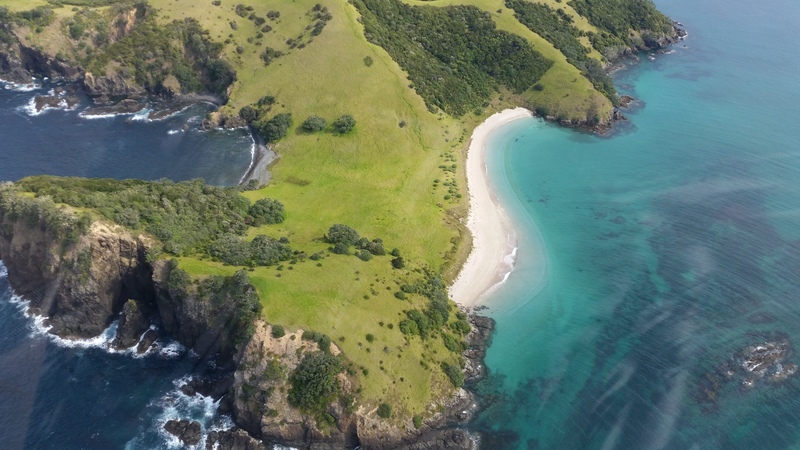 I will be on North Island for 2 weeks. 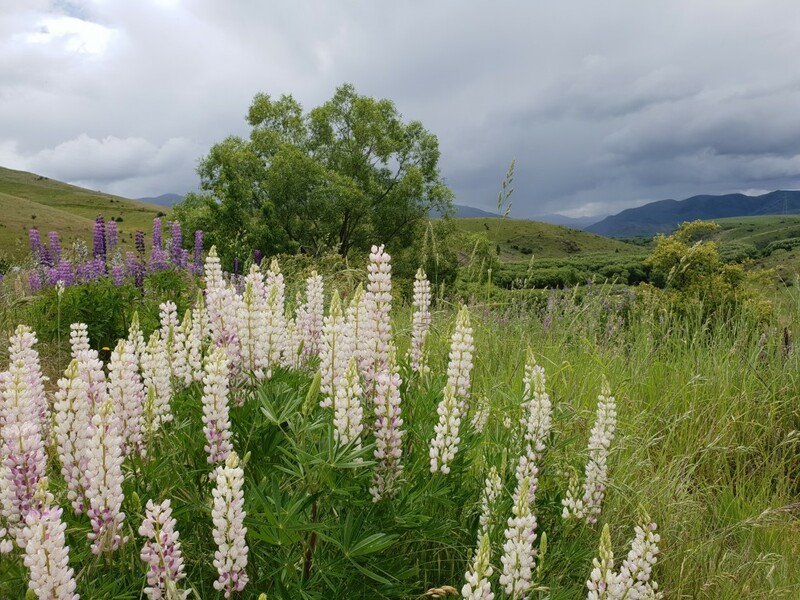 Starting in the Bay of Islands then on to Hastings for my final course ‘Flowers and Foliage’ and finally a few days in Wellington. Phew! Quite an adventure to look forward to, seeing old friends and hopefully making some new ones too! I plan to post more photos and updates each week. I have just got home after a few days in London. It was an opportunity to feed my creativity by visiting lots of galleries and take a break from teaching and my studio work. 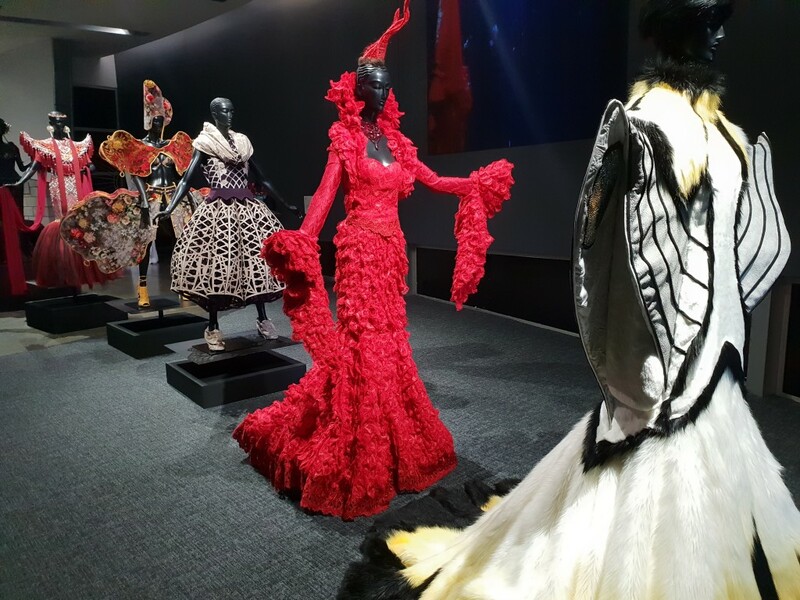 It was a great mix of exhibitions, theatre, restaurants and a little retail therapy. I was fortunate to be invited to Burberry House to see the lastest catwalk collection from London Fashion Week. Amazing clothes and fabulous fantasy capes inspired by Henry Moore sculptures. Some made out of found objects others sculpted out of metal, wood or leather. It was great to see the Burberry collection, but the real treat for me was the chance to see sculptures, maquettes, sketches and studio tools giving a great insight into Moores way of working. 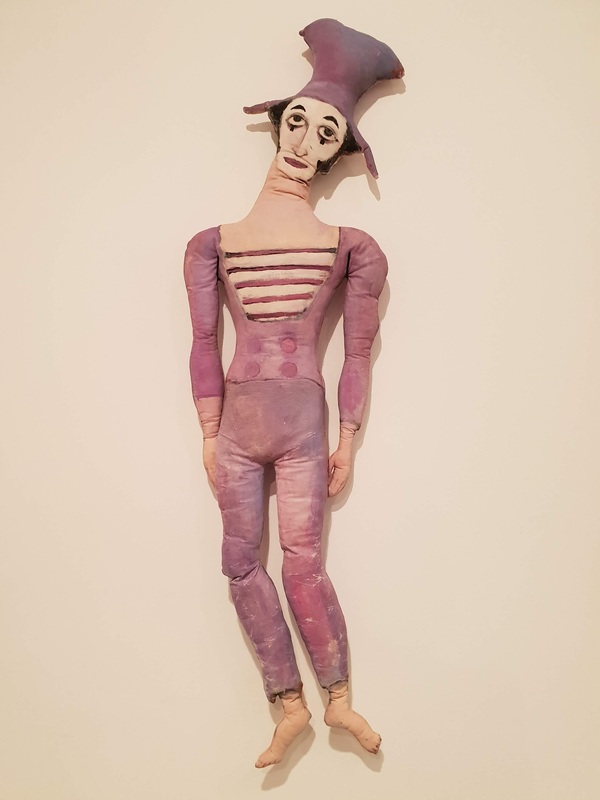 Over the few days of the trip I went to the Mall Galleries to see the Pastel Societys Exhibition, Tate Britain for the Hockney and the RA for the America After the Fall Exhibition, lots of visual treats. I love to look at other artists work, their techniques, colour palete, choice of compositions. I am inspired by the brave choices and bold decisions they make and hope it encourages me out of my comfort zone! On the way home we made a detour for Stanley Spencer. We visited the lovely gallery in Cookham, his home town. The unfinished Christ Preaching at Cookham Regatta is on display there and it was like meeting an old friend! On seeing it for the first time in the RA I was fascinated by the unfinished areas as much as the finished sections of the painting. I particularly like the details on the mop head and the check trousers of the centre figure. I first saw his work at a retrospective at the RA about 30 years ago and have been a huge admirer of his work ever since. I especially love his eye for colour, pattern and rhythm. I really intended to write a blog for each city/location I visited during my trip to Australia this autumn. Each place was rich with sight seeing, great students and good times. You will probably have noticed it didnt happen! So here is my tale of the whole 6 week trip. End of October I arrived in Canberra, a new place for me to visit. Before I started teaching I had a couple of days to get over the journey spent looking around the surrounding countryside and the downtown area. My hosts were very generous with their time and I enjoyed seeing a lot of the spacious green city. Built around a huge man made lake there are fantastic vistas of the ANZAC Parade with Government House one end and the Australian War Memorial at the other. I love the story about both Melbourne and Sydney wanting to be the Capital as as neither would give in to the other they built Canberra! 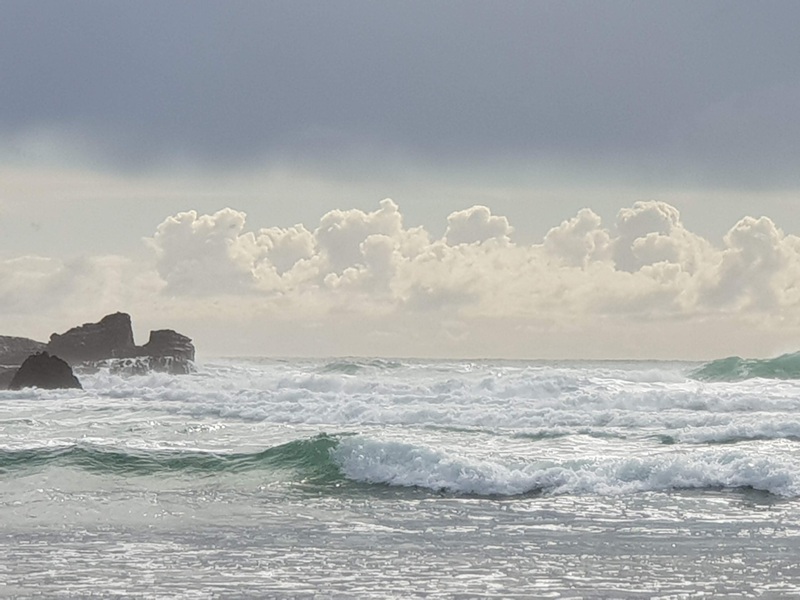 I taught 2 courses, “Dramatic Skies” and “Seascapes” so I was there for a week in total. Thank you Leonie and Lorna for taking great care of me. I moved on to Melbourne next for 2 weekend courses, “Up Close and Personal” and “Textures in Nature”. This meant I had 5 days off in between the 2 weekends in such a great city with so much to see and do. Fortunately I coincided with the last few days of the Australian textile artist Annemeike Miens exhibition and the first day of the David Hockney! What a lovely way to spend time off. There was a Banksy exhibition on too so it was a visual feast for me. I always meet new students keen to learn my techniques but also several who I have taught before. As the number of my visits increase the friendships grow, we keep in touch and I look forward catching up with them. At the Annemeike Mien exhibition I bumped into 2 women I knew, that’s a strange but lovely situation to be in the other side of the world! There is a large selection of the work by my Australian students on the website courses page. There were 6 courses in total so a wide range of work and a lot of talent to see. Sad to leave Melbourne but with more places to go, I flew to Syndey for a few days, staying in Manly and travelling into the CBT on the ferry each day. Its such an iconic sight, as the Opera House and the Harbour Bridge come into view. 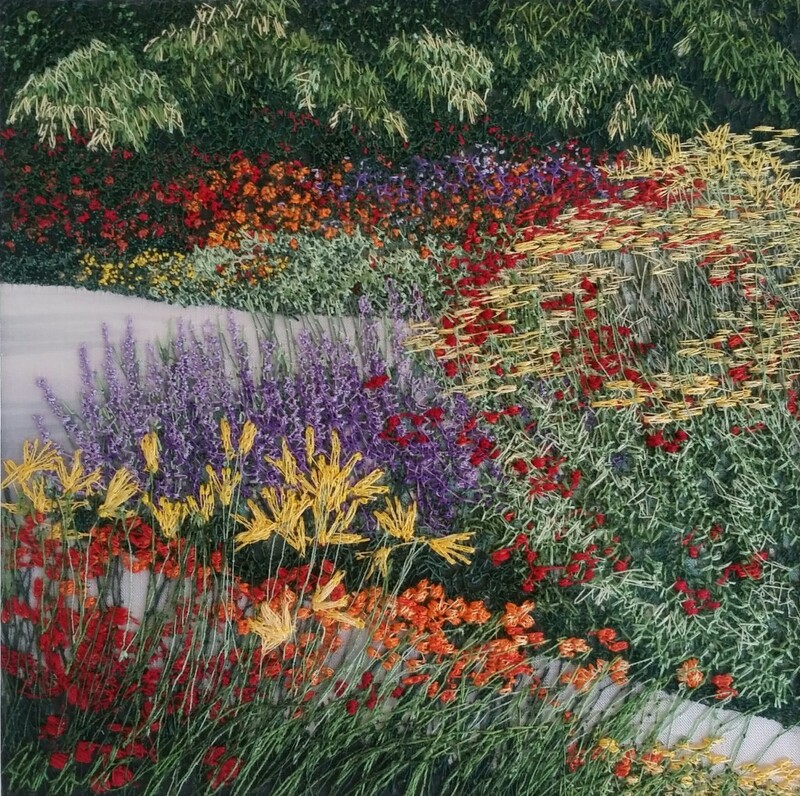 I hand delivered an embroidery that was bought at the Chelsea Flower Show in May earlier this year. Can’t promise everyone that service but it just worked out I could do that! I enjoyed the Rocks and The Botanical Gardens were fabulous, 2 days were spent there taking photographs, lots of inspiration! 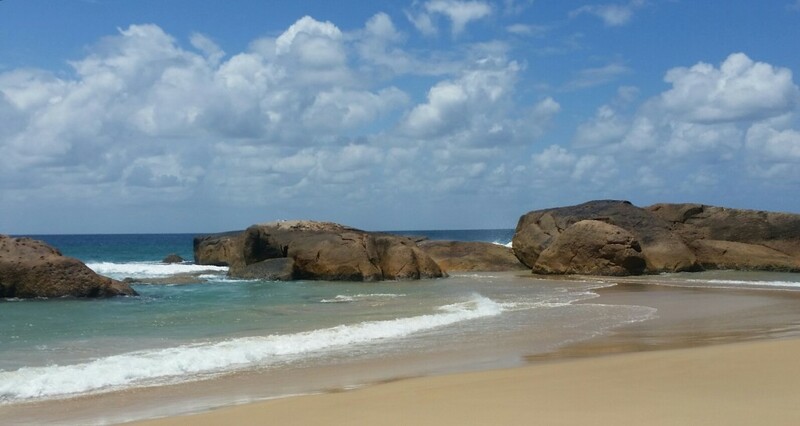 Next venue was Harrington, a 3 hour drive north of Sydney on the coast. 2 more courses here for Jen at Love Patchwork. 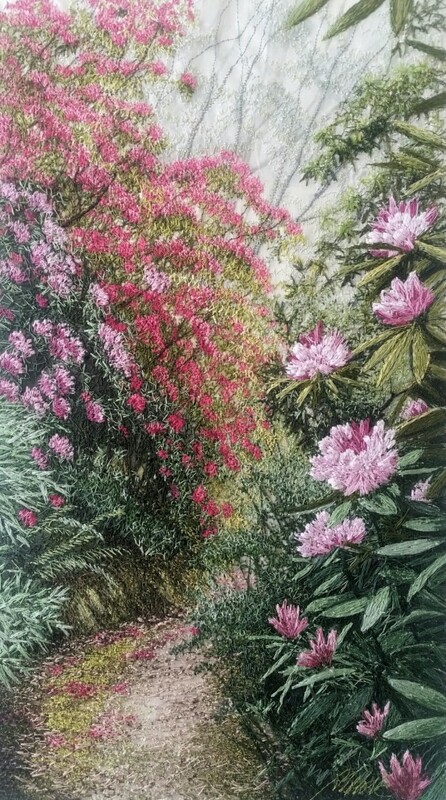 “Landscapes” and “Flowers and Foliage”. Jen and her friend Cecily had been to Margaret River on my Seascapes course in 2015 so it was really good to meet up with them both again. View from my teaching room! I had a wonderful room to teach in, overlooking an estuary and warm sunny weather too. It was a great week, exploring the area and meeting all the neighbours. The trip ended with a few days in Queensland on Hamilton Island. Time to unwind, sit in the sun and think about what a great experience it all was. I am often asked why I keep returning to Australia. It’s an extraordinary country with warm hearted generous people. I hope my plans for a trip in 2017 work out so I can enjoy even more of the same. The year is flying by and the variety of my activities certainly speed it along! 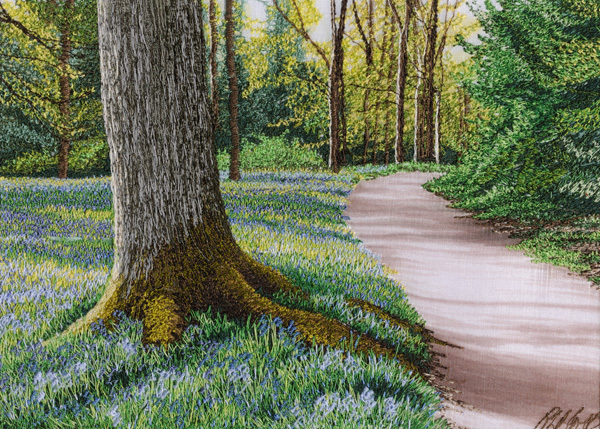 I am enjoying teaching a few embroidery courses this summer in beautiful locations, Brighton, Dorset and of course at my home studio in Shropshire. A range of subject matter as always, to keep me fresh and enthusiastic. Rivers and waterfalls, flowers and reflections in water are the themes. 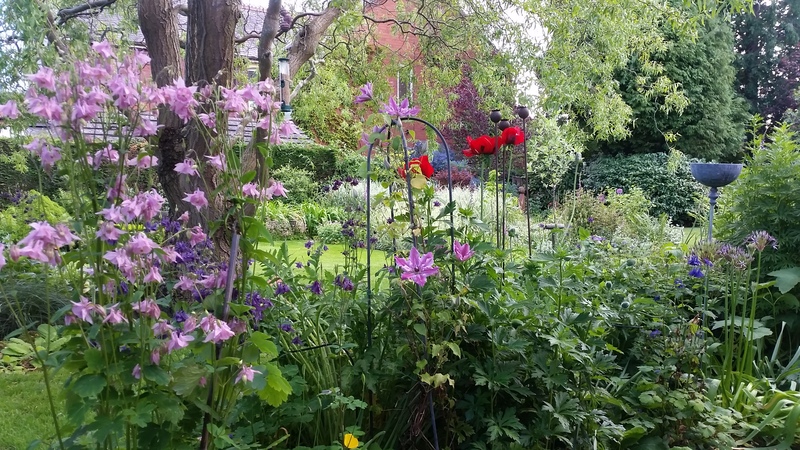 I am inspired again by another trip to the Chelsea Physic Garden where some close ups shots of their colourful borders gave me some great source material for the “Up Close and Personal” course in my Garden Studio this month. 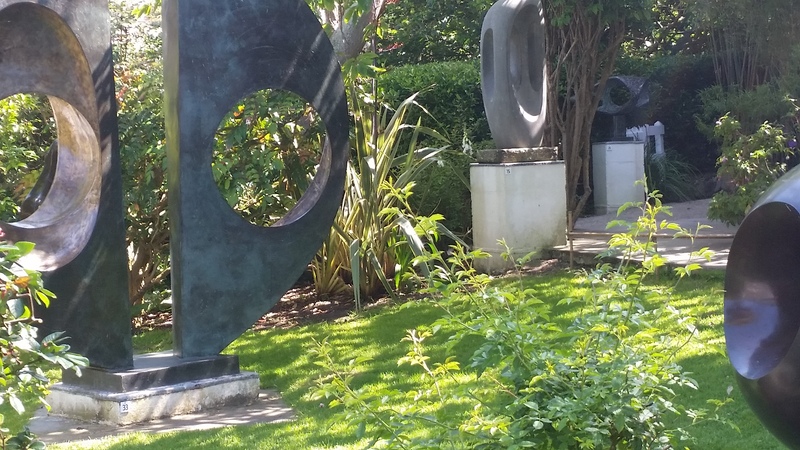 My trip to London was filled with visits to galleries and gardens, it was a great few days break. 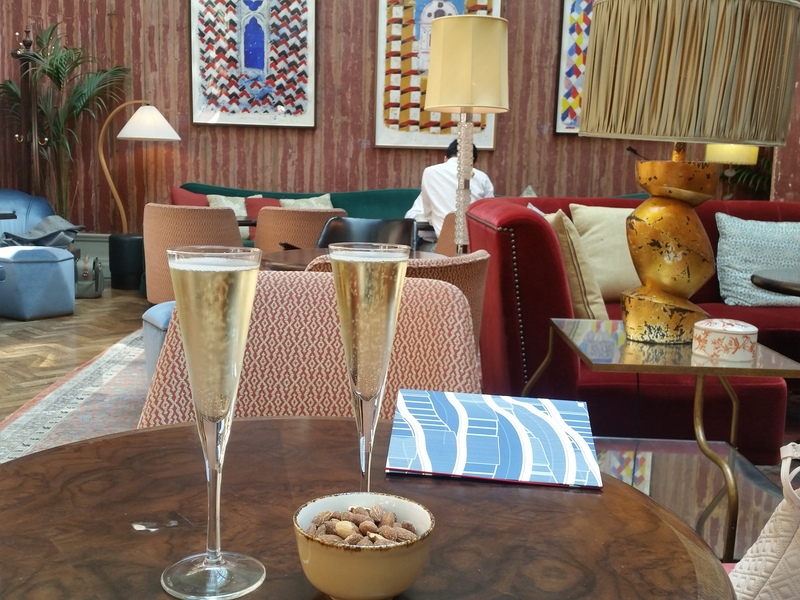 The RA Summer Exhibition was a wonderful eclectic mix as usual and a return trip to the RA to see the Hockney – 82 Portraits and a Still Life completed the visit in style. Lunch in the National Portrait Gallery gave us great views over London! I have just got back from a wonderful week in Italy with my family. We stayed in Reusa, near Fizziano, up in the mountains north of Pisa in a beautiful villa with views to die for. 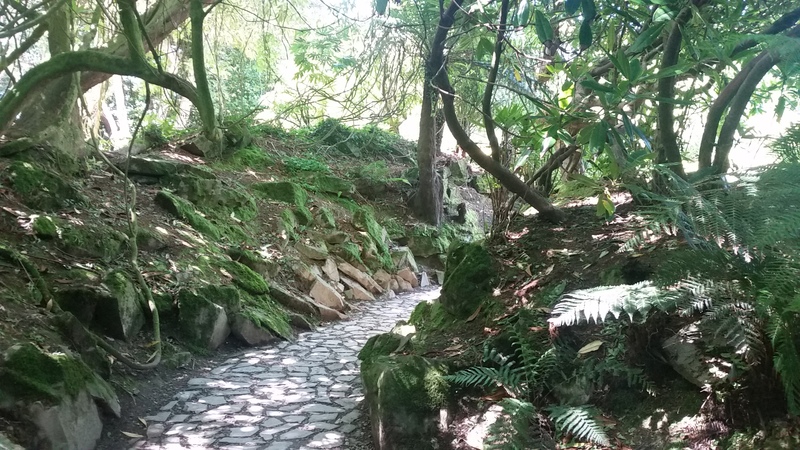 We visited Tellaro on the Italian Rivier and had a day in Florence and Lucca for a culture fix. I was trying to have restful time before my big trip to Australia and with good food, long leisurely lunches, great company and sunshine, I succeeded! There are only a few days left until I fly to Perth so I am busy gathering everything together for my trip. I have a lot of courses to prepare for and a few clothes to pack too! I have a few things to do before I go, deliver some pictures to the Willow Gallery in Oswestry and an article to finish for the Swedish Embroidery Magazine. I am really looking forward to meeting all my students when I get to Australia. 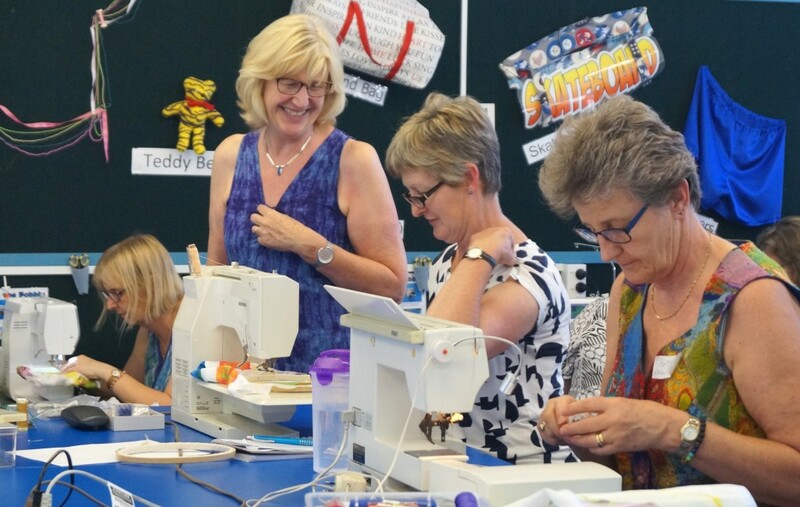 I will be teaching at Fibres West for the first week, then on to Melbourne to teach another course over the weekend. 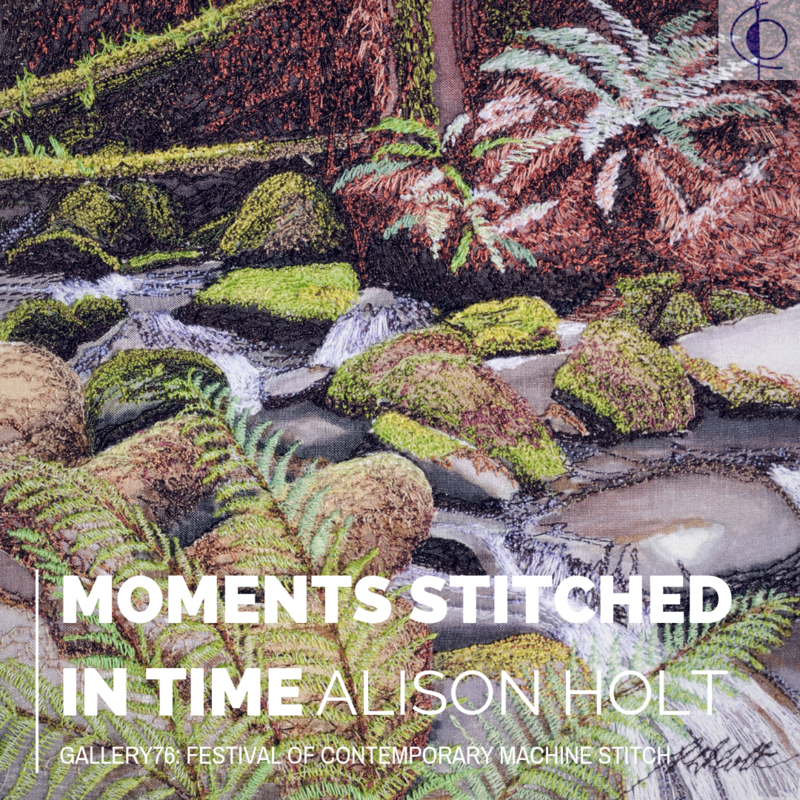 During my time in Australia I will be exhibiting my embroideries in Melbourne at the Firestation Print Studio Gallery with textile artist Carly Leech. 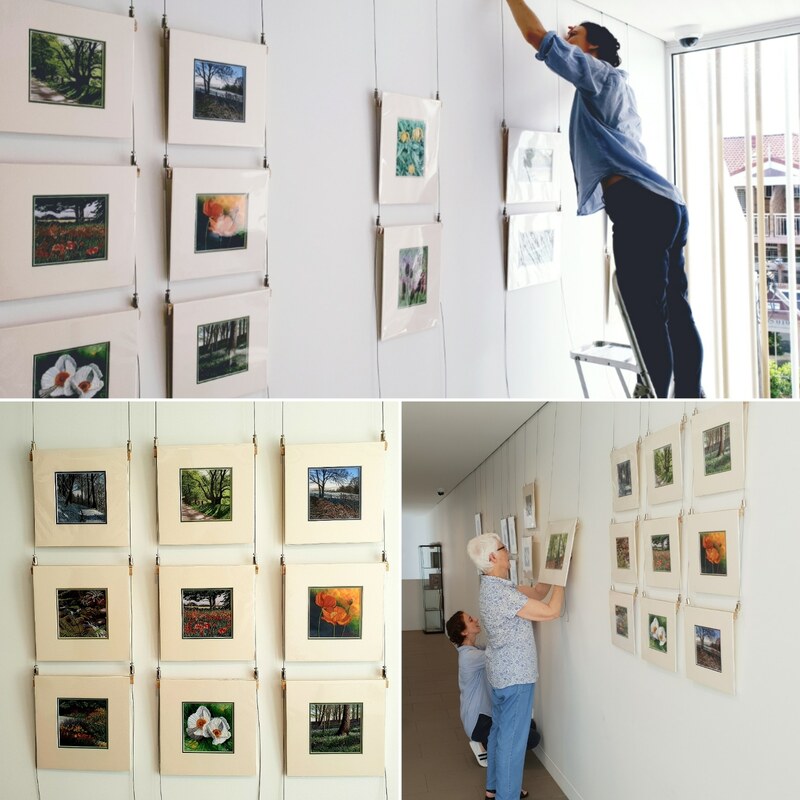 Our work will be on display from October 14th to 24th. I first met Carly at the Tasmanian Craft Fair in 2013, she flew from Melbourne to visit me there. Carly and her friend Sue are the organisers of my course in Melbourne this year and we are planning one for 2016 too! 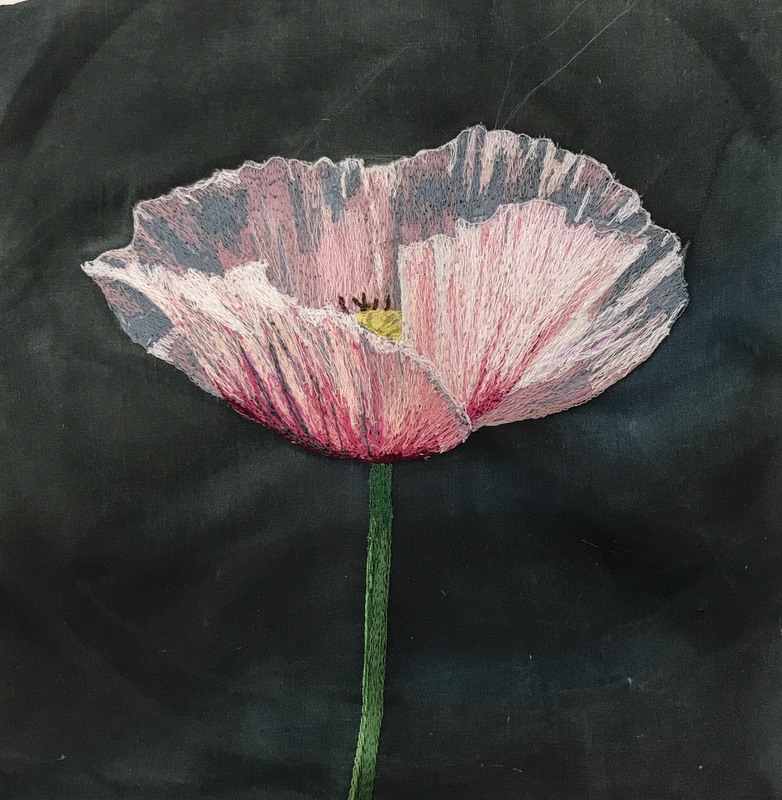 After teaching in Melbourne for the Embroiderers Guild and then in Deloraine, Tasmania at Elemental Artspace, I will head back to Perth for yet another course! Then down to Margaret River to complete my 6 courses in 6 weeks away. A very busy schedule, meeting up with some very special friends from my last visit. I plan to post my travel progress on this blog so you can keep track of me!